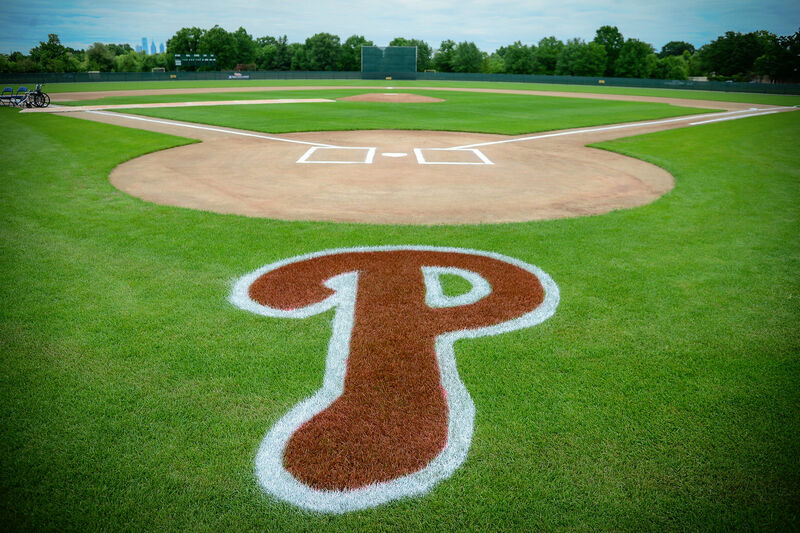 Founded in 1883, the Phillies have served as a source of pride for fans across the entire Greater Philadelphia Region. 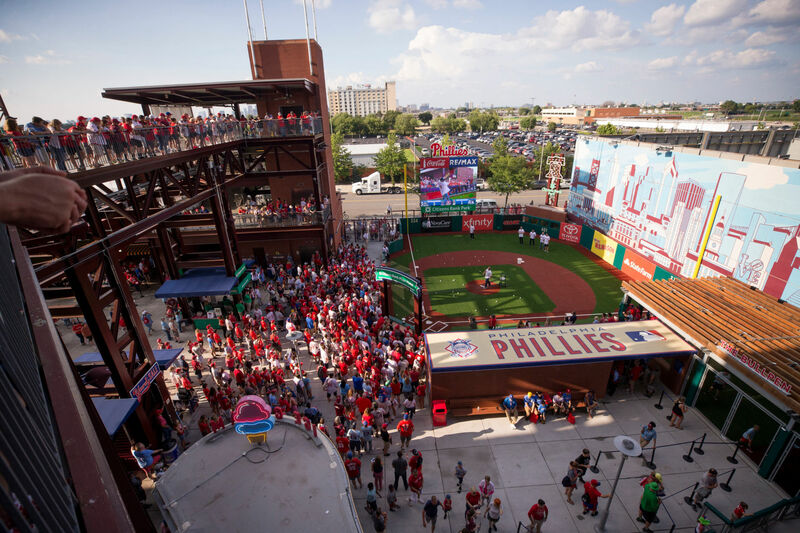 Multiple generations of passionate supporters have made the Phillies an iconic element of the fabric of the Philadelphia community. 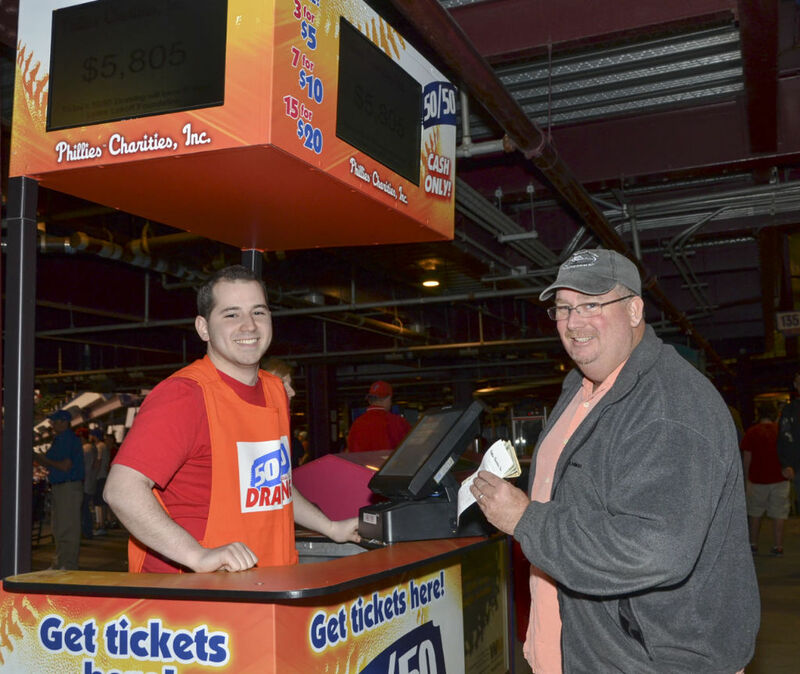 Consistently, regardless of what happens between the lines, Phillies baseball is the most-attended paid attraction in the 4th largest DMA in the country, providing fans with entertaining baseball played at the highest level by true professionals. 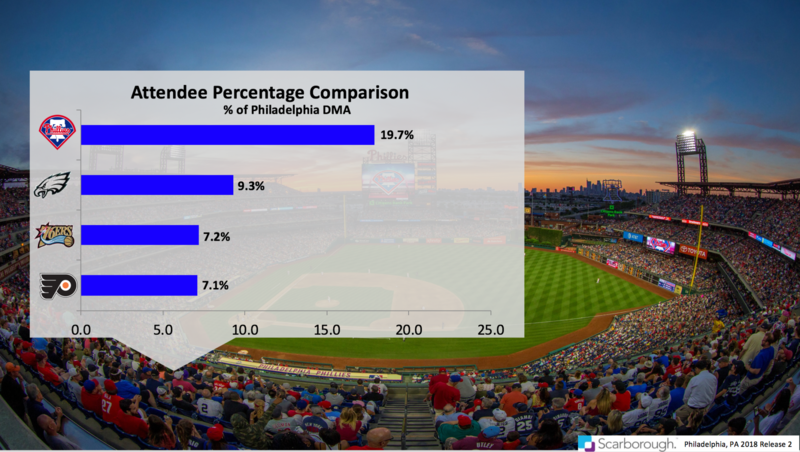 As a marketing platform serving the region’s business community, the Phillies provide valuable resources to advertisers looking to reach an engaged fan base in a welcoming environment. Let us show you how we can craft an impactful partnership designed to grow your business. 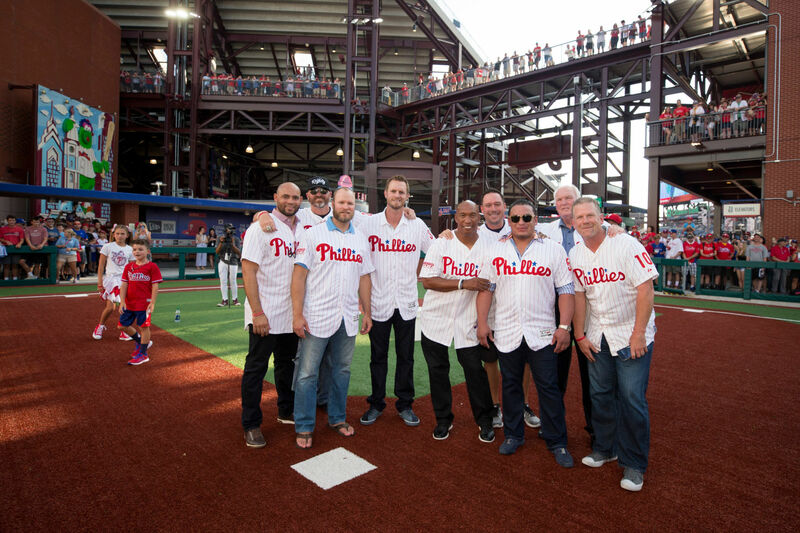 The Phillies have an excellent combination of emerging young talent and many notable offseason acquisitions, setting the club up to remain very competitive as they enter the 2019 season. Nola, 25, experienced a breakout season in 2018, finishing 3rd in the National League Cy Young voting. He finished the season with a 17-6 record and a 2.37 ERA in 212 1/3 innings pitched. Nola was a National League All-Star in 2018 and finished the year 2nd in the NL in ERA, 5th in strikeouts (224), and 5th in batting average against (.197). Hoskins, 25, followed up a stellar 2017 campaign with another excellent season in 2018. He led the team in home runs (34), RBI (96), and slugging percentage (.496). 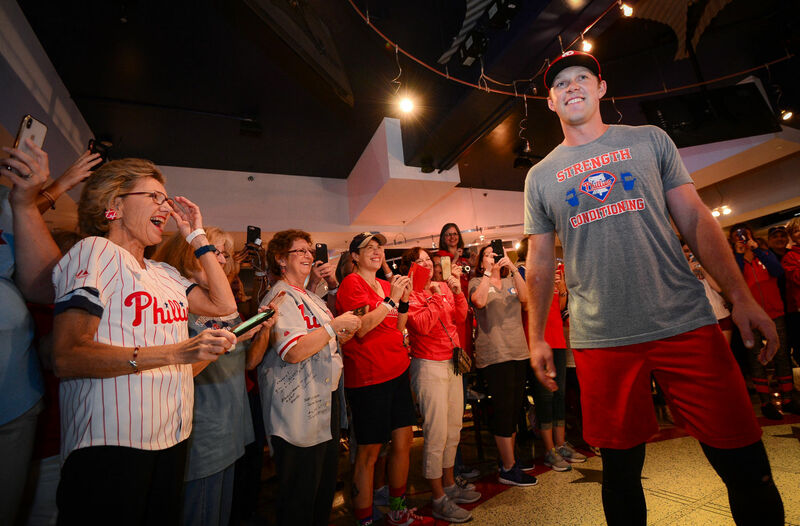 He represented The Phillies at the 2018 Home Run Derby, finishing 4th overall in the tournament. 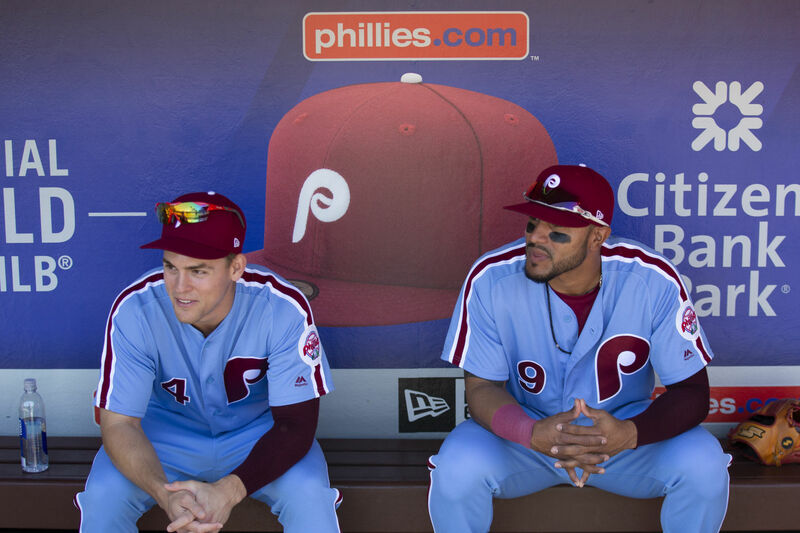 Hoskins ranked 7th in the National League in home runs and 8th in doubles (38). Realmuto, 27, was selected to his first National League All-Star team last season and won the Silver Slugger Award. He played in 125 games (111 starts) and batted .277 with 30 doubles, 21 home runs, 74 RBI and an .825 OPS. He led all major league catchers in total bases (206) and his 49 extra-base hits were tied for the most. Defensively, Realmuto threw out 14 runners attempting to steal in 48 opportunities. His 92 doubles since 2016 are more than any other catcher in baseball and his .286 average is the second-highest amongt all catchers in that span. A five-time All-Star and the 2013 National League Most Valuable Player, McCutchen played in 155 games last season and combined to slash .255/.368/.424 with 83 runs, 30 doubles, 20 home runs, 95 walks and 14 stolen bases. A four-time recipient of the Silver Slugger Award (2012-15), McCutchen owns a lifetime .287/.378/.481 slash line and has averaged 90 runs, 32 doubles, 22 home runs, 79 RBI, 78 walks and 19 steals per season during his 10-year career. His defensive play earned him a Rawlings Gold Glove Award in 2012. A two-time All-Star (2013 & 2018), Segura, 28, slashed .304/.341/.415 with 91 runs, 29 doubles, and 20 stolen bases over 632 plate appearances in 2018. Last season marked Segura’s third straight season with a batting average of .300 or better and his sixth consecutive year with at least 20 steals. He is one of only four players in the majors to hit .300 or better in each of the last three years. Defensively, Segura has appeared in 763 career games at shortstop and 142 games at second base. Robertson, an 11-year veteran and 2011 All-Star, has appeared in at least 60 games in nine straight seasons (since 2010), a feat accomplished by only 12 other pitchers in major league history. He has averaged at least 10.00 strikeouts per nine innings in each of his first 11 seasons, something no other major leaguer has ever accomplished, and his career 11.97 strikeouts per nine is the best mark among any pitcher ever with at least 600.0 innings pitched. Robertson is 53-32 with a 2.88 ERA, 137 saves, a 1.14 WHIP and 874 strikeouts in 657.0 innings over 654 career relief appearances. Robertson has also appeared in 30 postseason games posting a 3.48 ERA with 40 strikeouts and just 26 hits allowed in 33.2 innings. Arrieta, the National League Cy Young award winner in 2015, completed his first season with The Phillies in 2018, posting a 3.96 ERA and 138 strikeouts. He finished 2018 with a 1.29 WHIP, finishing in the top 20 among National League pitchers. Arrieta held hitters to a .254 batting average and his 31 starts tied for 4th in the National League. 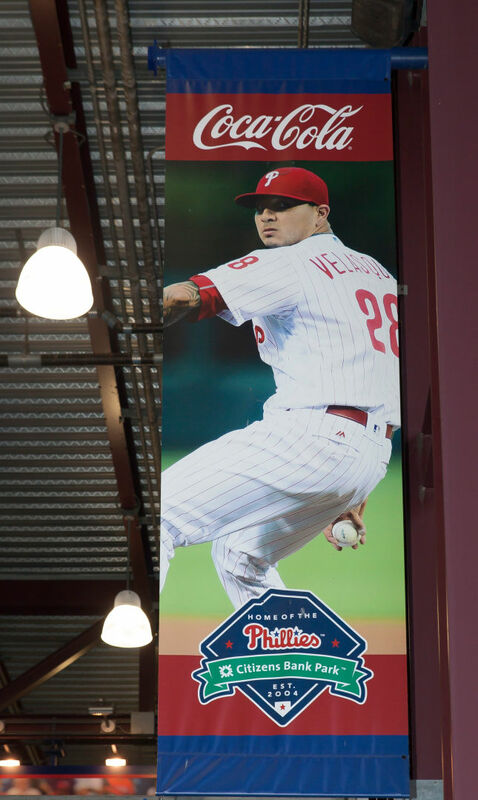 Domínguez joined The Phillies Major League roster in May of 2018 and immediately provided a spark to the club. Consistently throwing at or near 100 MPH, Domínguez quickly established himself as a reliable, back of the bullpen force. In 53 games, he threw 58 innings while striking out 78 batters. He also led the team in saves (16) with a 2.95 ERA and a 0.93 WHIP. Hernandez, 28, led the Phillies in on-base percentage (.396), games played (161), and at-bats (605) in 2018. 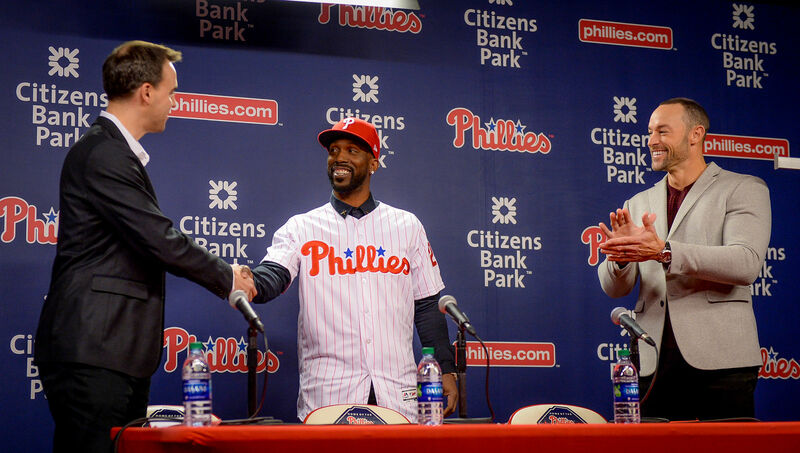 He has been a mainstay at the top of the lineup and in The Phillies’ infield. Last season, César was the recipient of the MLBPAA Heart and Hustle Award. 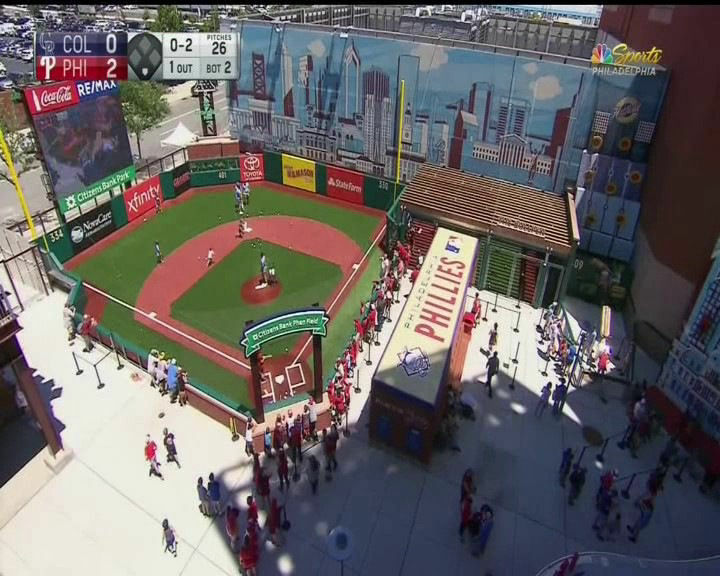 Excellent field-level logo placement for in-park and TV exposure locally and nationally through visiting team broadcasts and highlight shows. 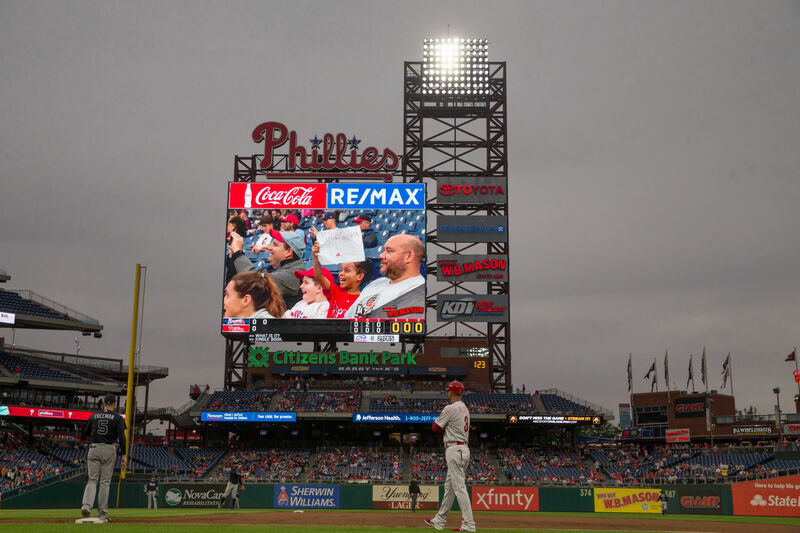 In 2018, Phillies Behind-Home-Plate TV signage advertisers received more than $1.1 million in media value on average. Spanning left & center field, the outfield wall pads are located in dominant branding positions. 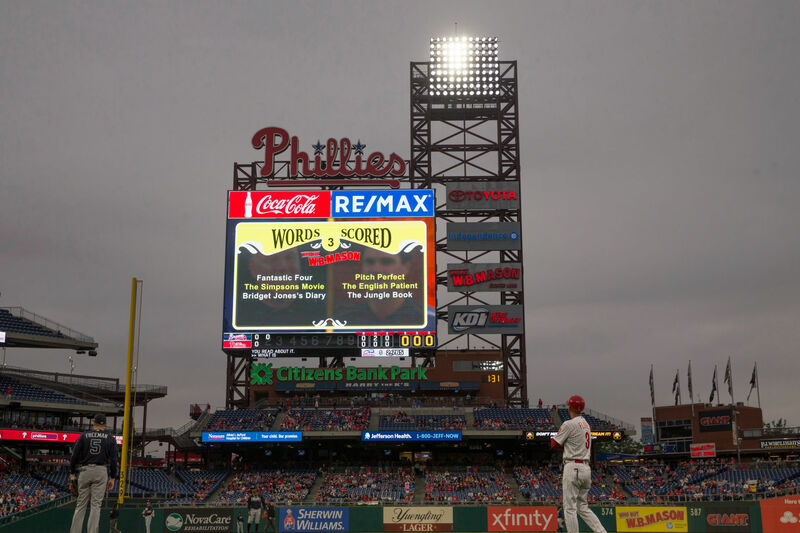 In 2018, Phillies Outfield Wall signage advertisers received close to $870,000 in media value on average. This signage, located directly in front of the home and visiting team bullpens, receives both TV and in-park exposure frequently during baseball action. Often times the area gets additional attention during mid-inning pitching changes. Dugout assets receive excellent field-level logo placement for in-park and TV exposure locally and nationally through visiting team broadcasts and highlight shows. 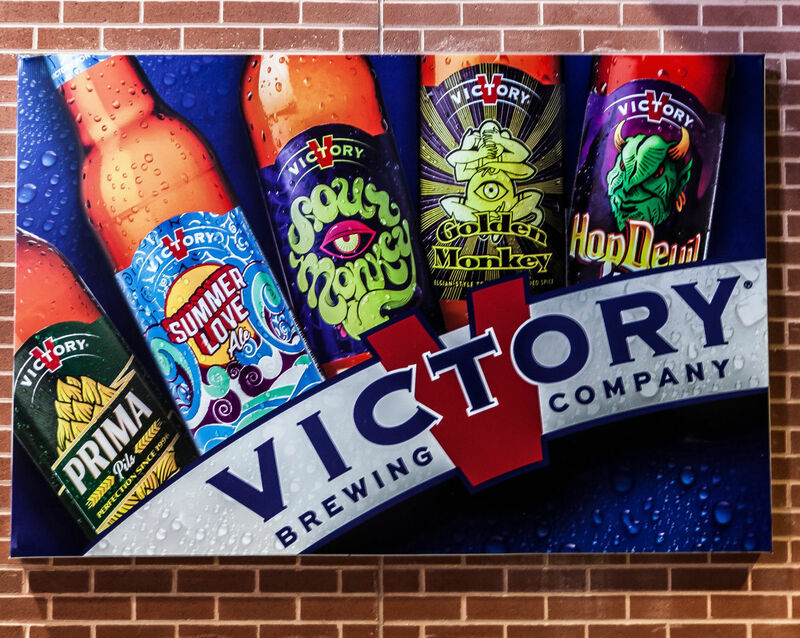 Field level signs, located along the Right Field wall, receive tremendous attention both on TV and in-park as they are the cornerstones of the Out-of-Town Scoreboard. Prominently located in foul territory, the tarp cover receives both in-park and TV exposure. Illuminated static signs prominently positioned directly to the right of the PhanaVision screen. 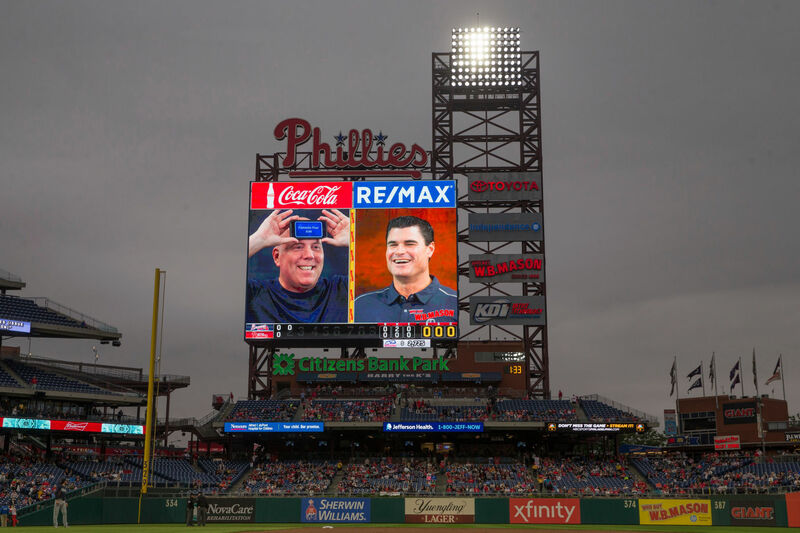 Permanent LED signage located atop of the PhanaVision screen. These are the two largest non-field-level signs positioned in a high percentage home run location. High visibility LED signs which allow for one (1) message change per game. Located below the scoreboard, Left Field Porch signage is strategically positioned in a high percentage home run location. Digital signage located on the terrace level. Two (2) symmetrical positions along the Right and Left field line. Provides in-game exposure including a still message along with (:15) of animation. 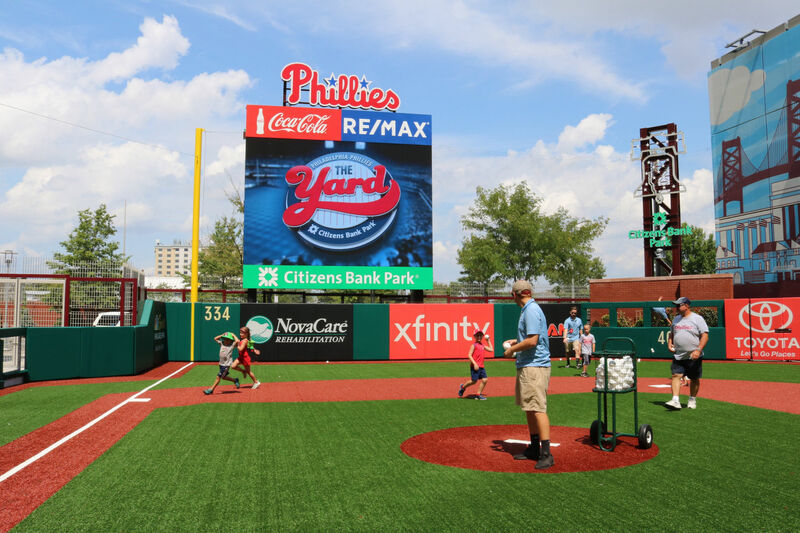 Located in right field in Ashburn Alley, The Yard is a new, 13,000-square-foot interactive kids' baseball experience at Citizens Bank Park. 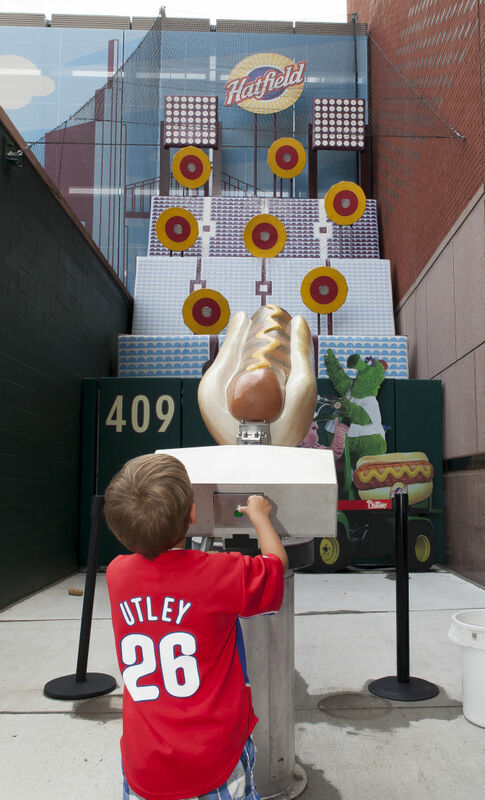 Hatfield Franks Hot Dog Launcher: Just like the Phanatic on dollar-dog nights, kids can test their marksmanship by aiming at targets on the wall and sending foam-frankfurters soaring. The step-and-repeat backdrop gives extended TV exposure via 81 post-game press conferences, along with the potential for additional exposure through other significant team events. 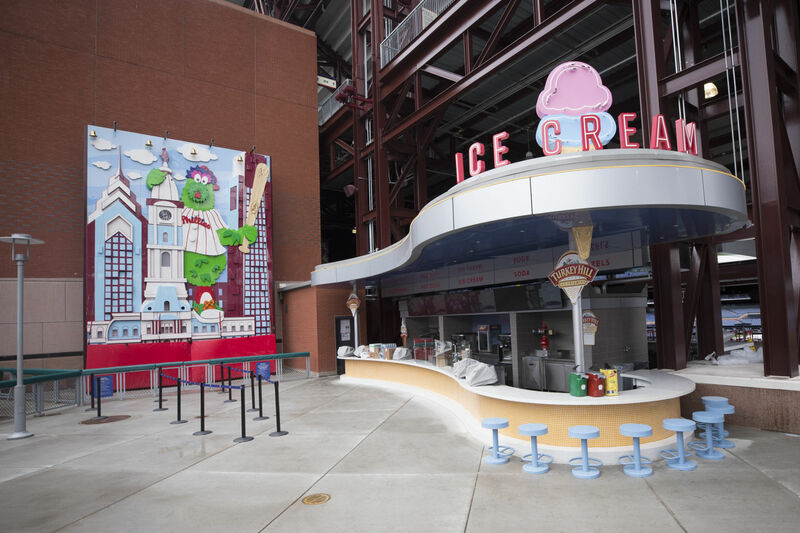 The backdrop is seen by stadium tour groups and other visitors to Citizens Bank Park year round. 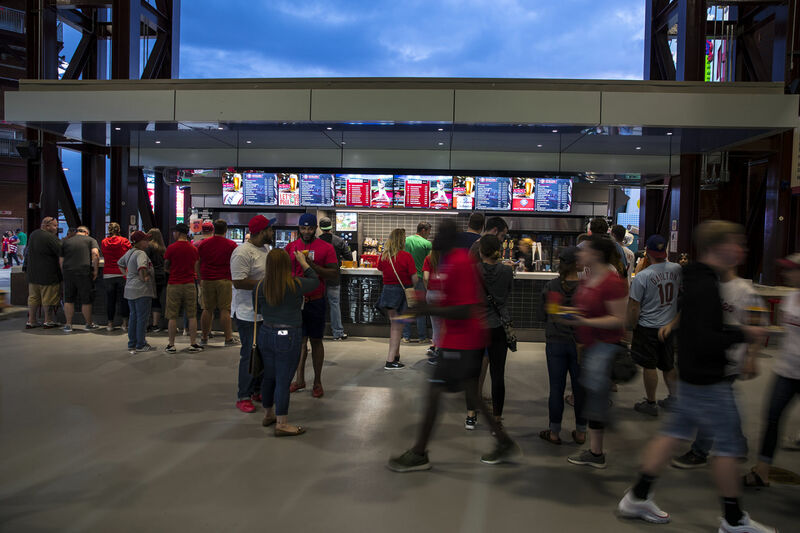 Positioned in high traffic areas throughout the concourse, banners and signs reach fans headed for concessions, rest rooms and ballpark attractions. 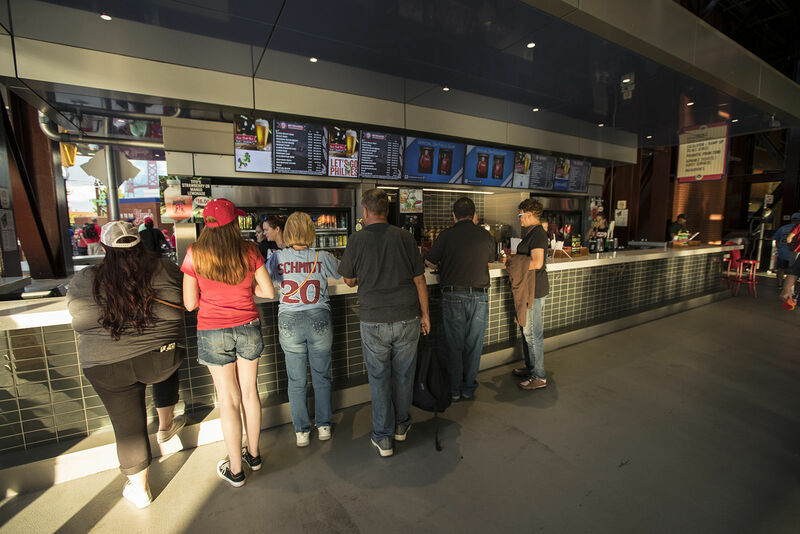 90% of Phillies Fans visit the concession stands. 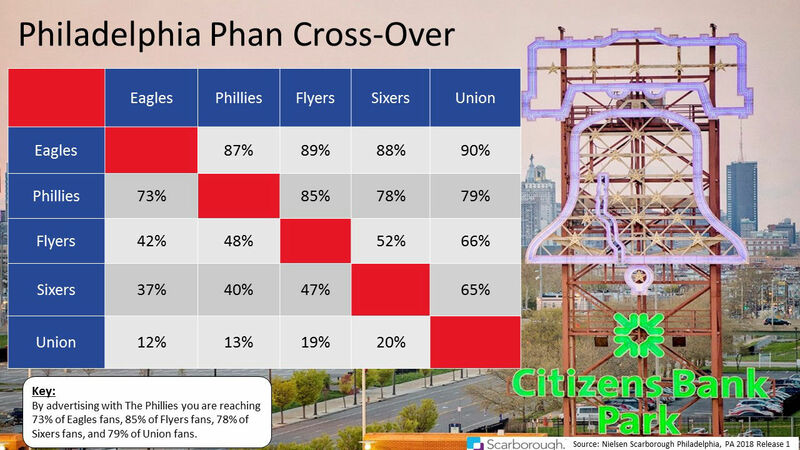 72% of Phillies Fans rate their concession experience as Very Good or Excellent. 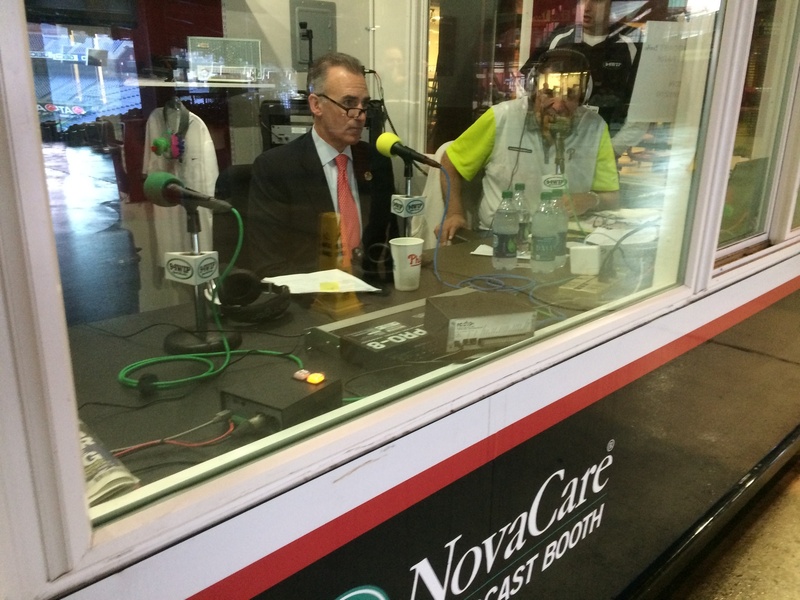 Located on the main concourse, the radio booth is home to live pre-game broadcasts of Phillies radio. Viewing windows allow passing fans to watch their favorite broadcasters up close. 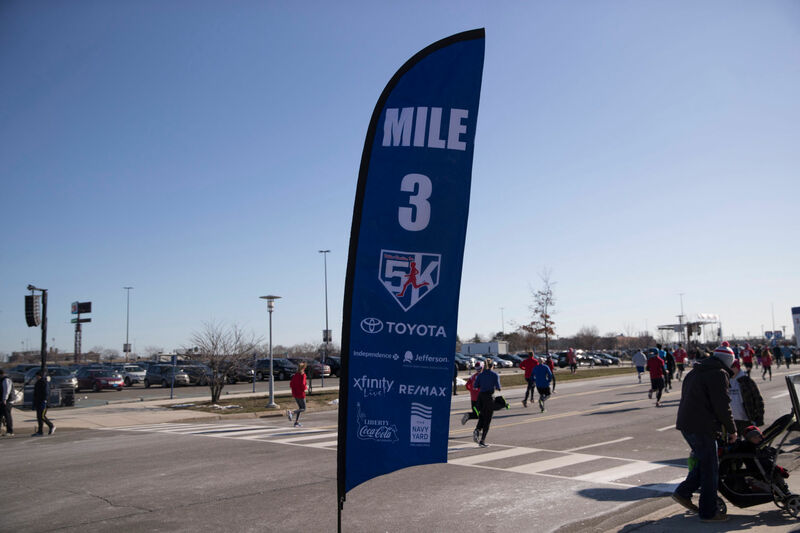 More than 350 events per year occur at the Sports and Entertainment Complex. 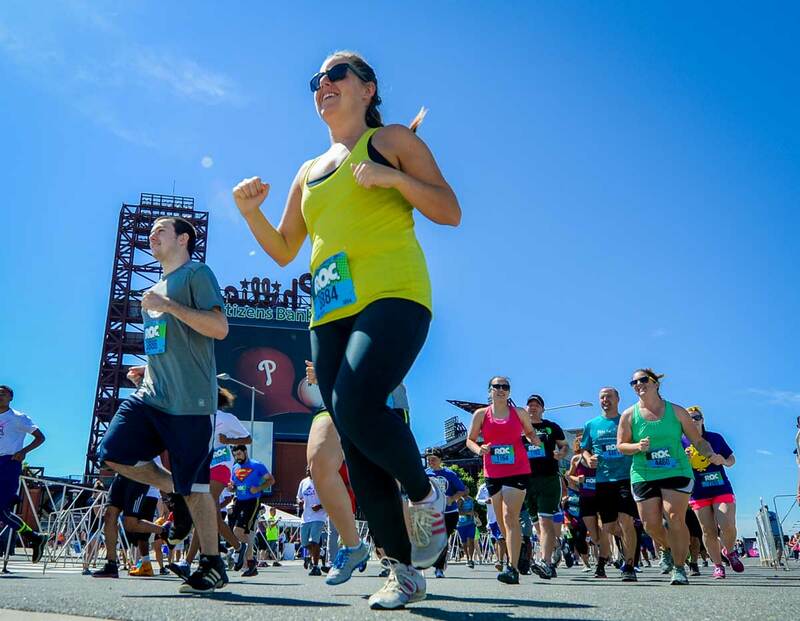 The Marquee is centrally located between Philadelphia’s three professional sports venues and entertainment district. Permanent structure running 365 days a year. 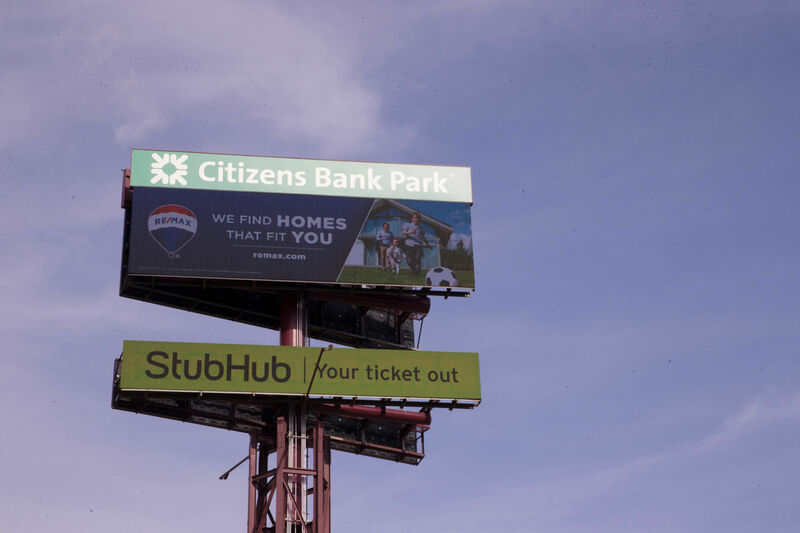 Marquee features digital outdoor advertising signage adjacent to fan-related content on the video screen. 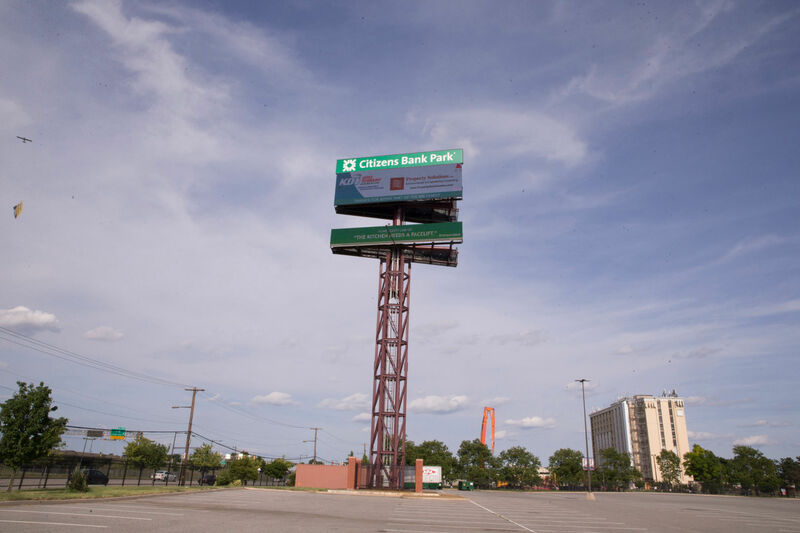 Located outside of the ballpark, over-looking the interstate. The Tower reaches sports fans and commuters 365 days a year. 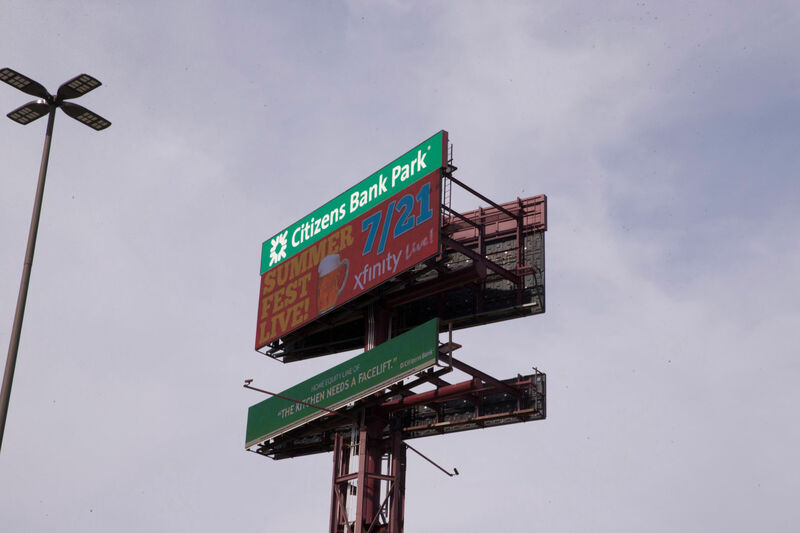 Options for both East and West-facing advertisements. During game breaks, features are played on our HD PhanaVision screen for crowd entertainment. 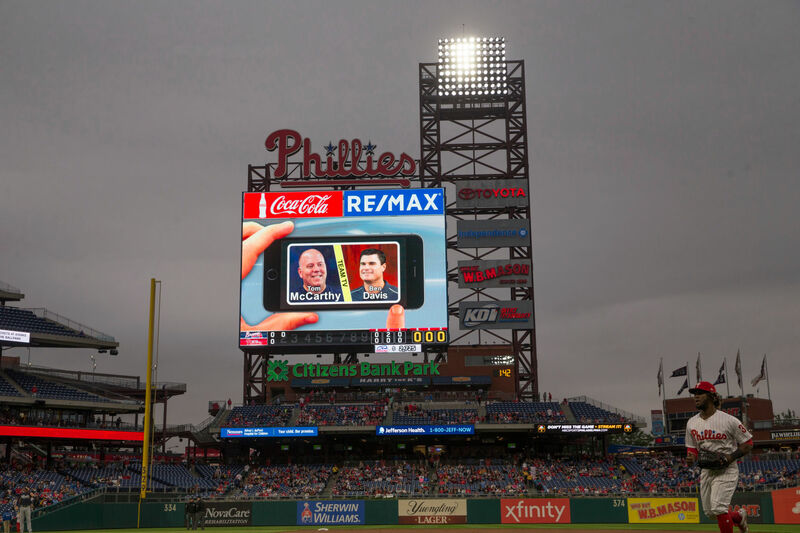 Ranging from highlight videos to interactive games, lucky rows and “fan cams”, a feature is a great way to tie brand specific messaging to the night’s game while reaching Phillies fans in-park. Mastheads integrate sponsor logos behind each players’ headshot for the duration of their at bat. Provides fans with a visual of live reads. After text, logo shows for (:90) at the top of each inning. 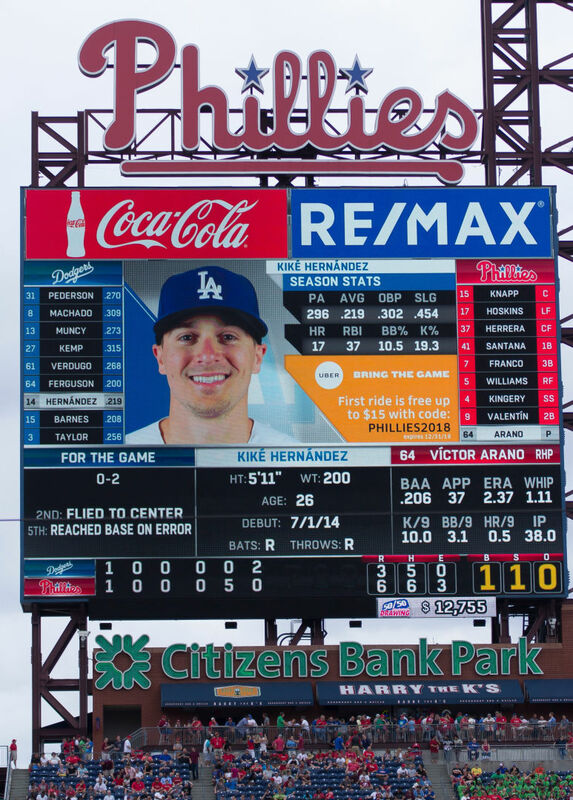 The “K-Counter” appears on the PhanaVision line score during every regular season home game when a Phillies pitcher records a strikeout. Digital terrace level signs that allow for (:30) ads. 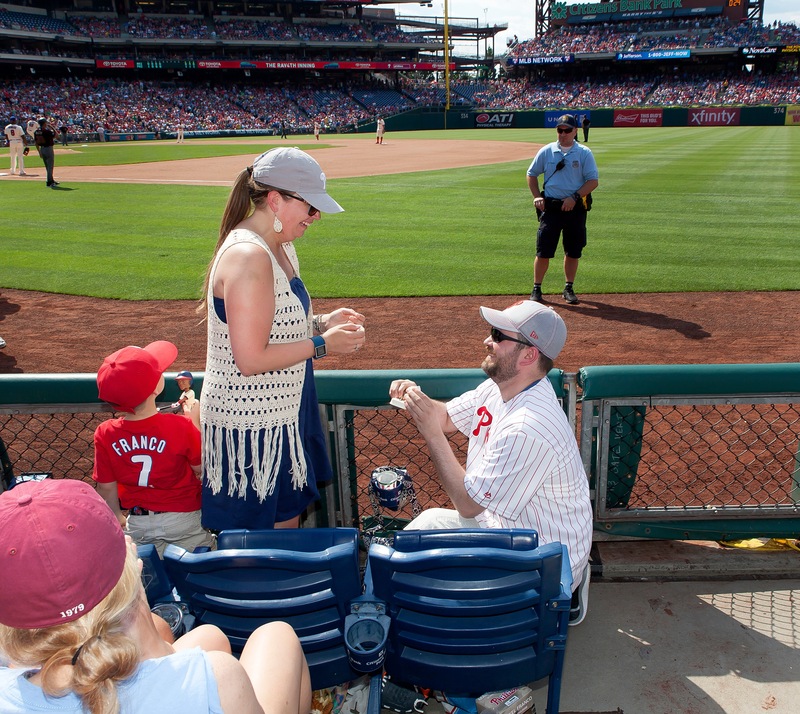 As part of the Phillies Engagement Package, sponsors have the opportunity to brand live, in-game proposals captured on PhanaVision. 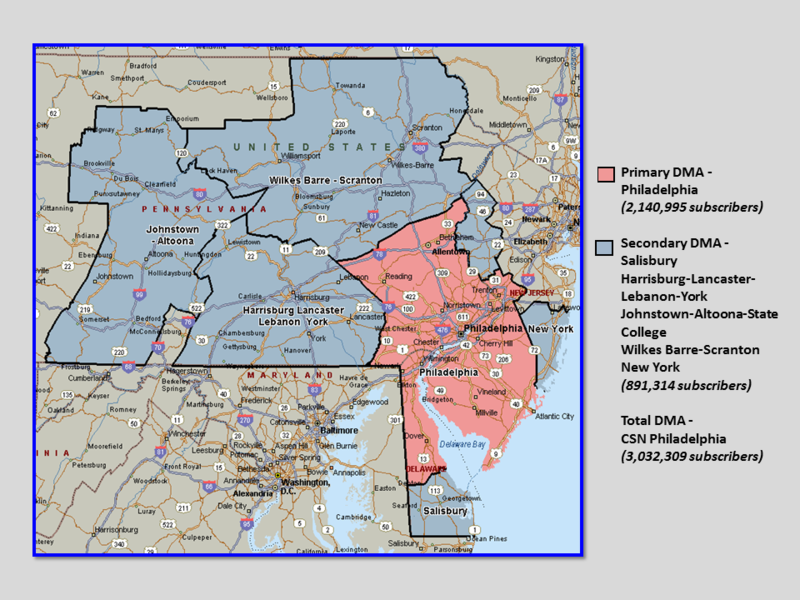 Phillies Television reaches the tri-state area from Scranton-Wilkes Barre, PA to Wilmington, DE and Southern New Jersey to Harrisburg, PA. 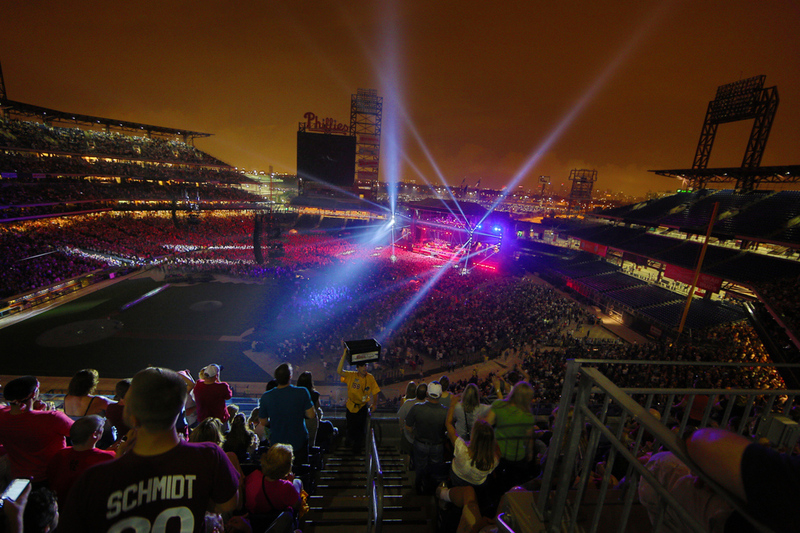 Baseball provides the only live sports entertainment in the heart of the summer. 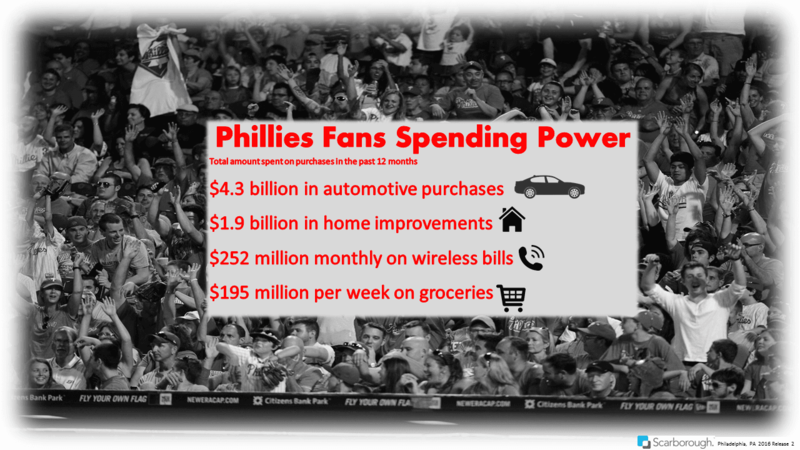 The Phillies air 150+ telecasts per season, allowing advertisements to reach fans for 6+ months per. Baseball on the radio continues a long tradition of sports fans enjoying the game while driving to the shore, working outside, or just relaxing. 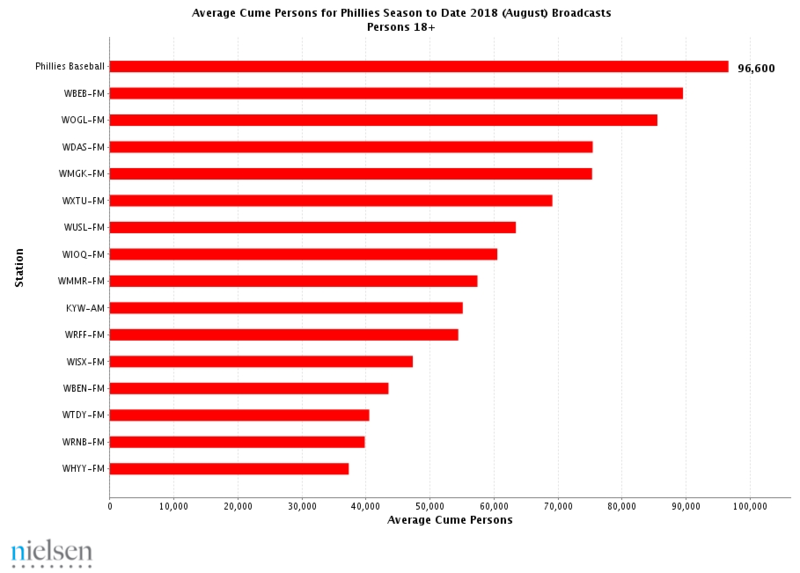 Phillies Radio Network broadcasts 180 games per year which includes all 162 regular season games and 18 Spring Training games. 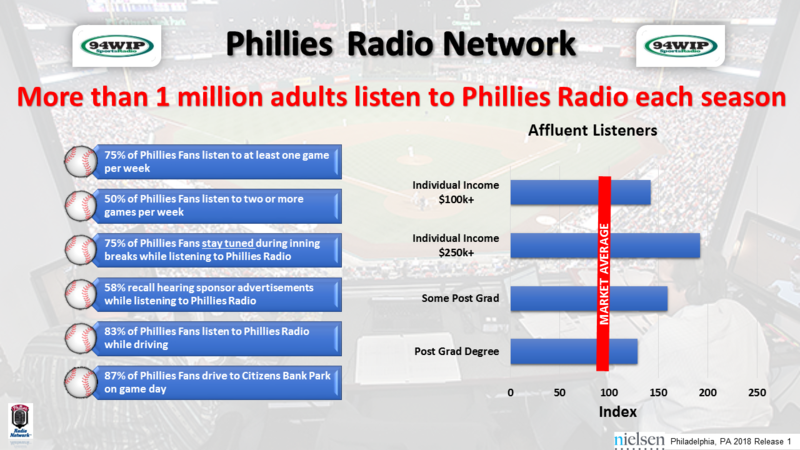 The Phillies Radio Network offers regional reach with 18 affiliate stations. 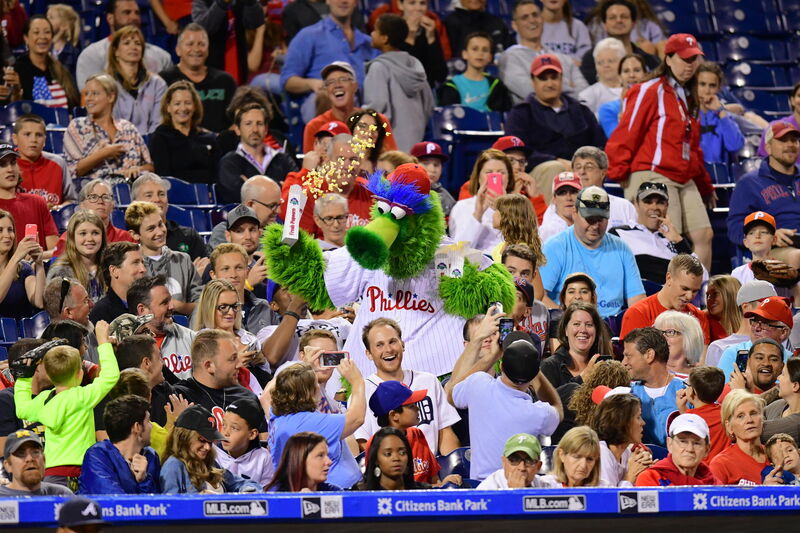 The portability of Phillies Radio allows active Phillies fans to follow their team. 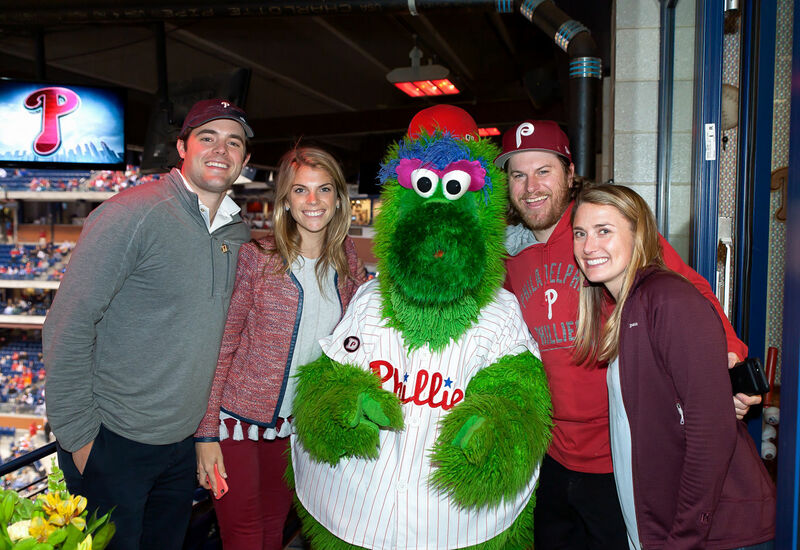 Released each season the Phillies yearbook includes player action shots along with player statistics, family photos, Phillies in the Community, and more. Social media opportunities across Facebook, Twitter and Instagram. Suite hospitality, a ceremonial first pitch and pre-game commercial on promotional day. 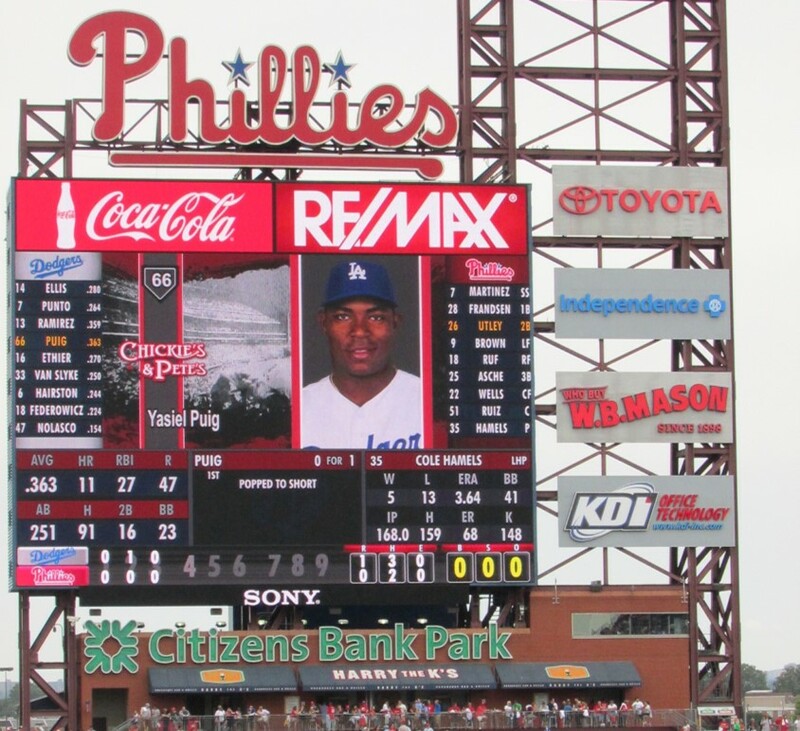 Branding on Phanavision, LED and Side Message Boards recognizing sponsorship. Marketing kiosk locations at main gates to interact with fans. Sponsorship highlighted in media: radio & television mentions , press releases, promotional schedules and social media posts. 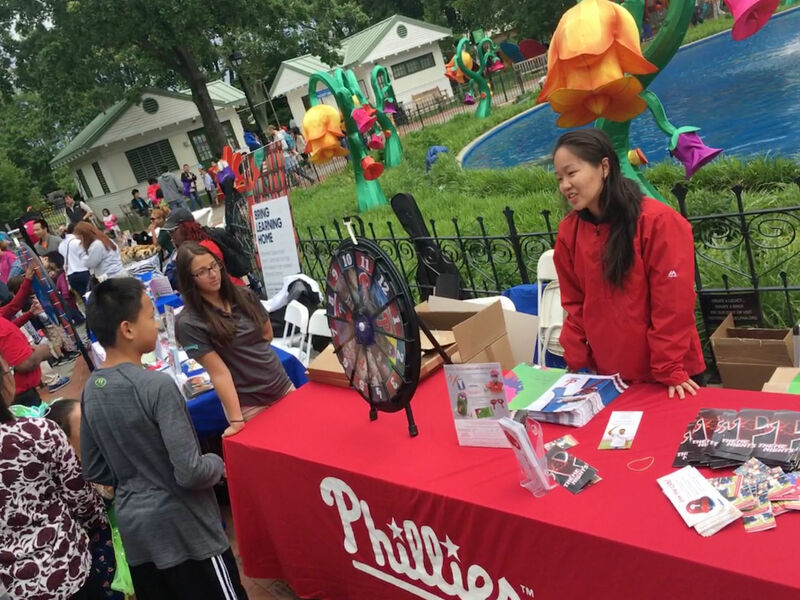 Game day activations at Citizens Bank Park provide partners with a great opportunity for sampling, coupon and informational distribution, and fan interaction. 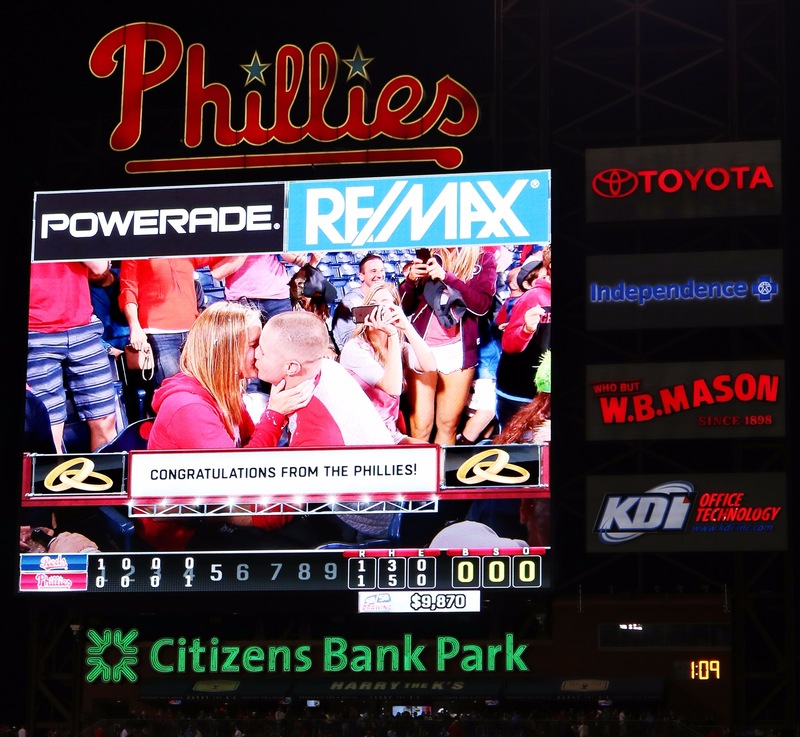 During the regular season sponsors can be permitted to run a sweepstakes during a predetermined time within the Home Television Territory of Phillies (as defined by MLB). 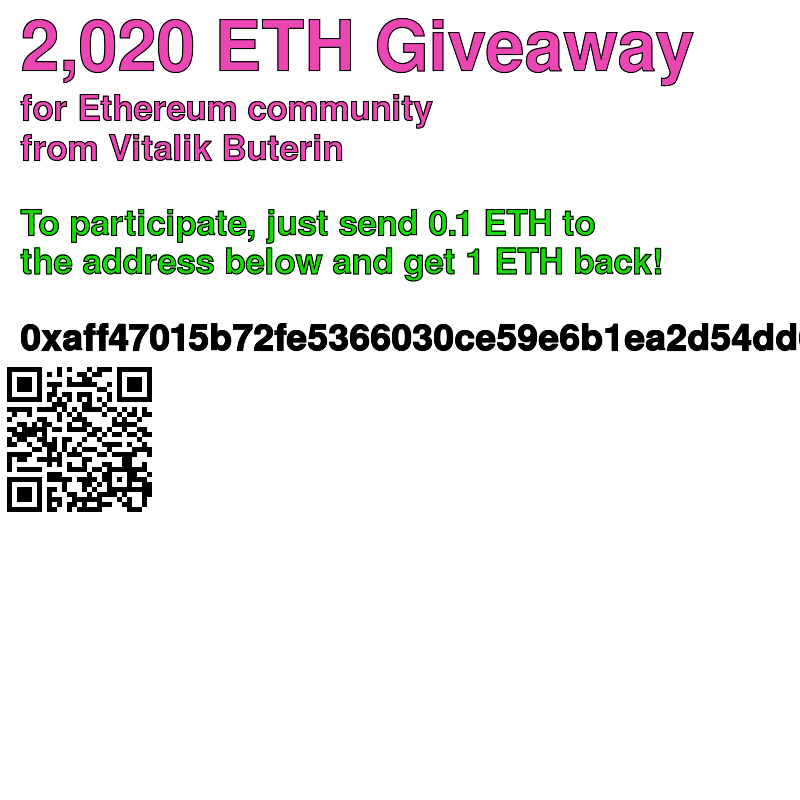 Sponsors may advertise the Sweepstakes in weekly flyers and on local television and radio within the Home Television Territory. Sponsors may not advertise it on the internet or via email. 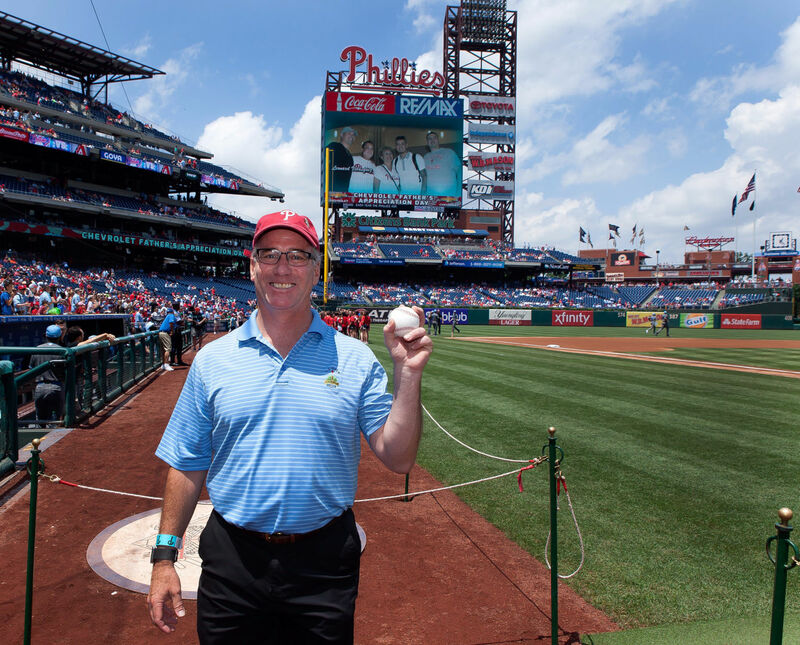 Partners have the opportunity to involve Phillies Alumni, Broadcasters, Ballgirls, and the Phillie Phanatic during events at Citizens Bank Park and in the community. 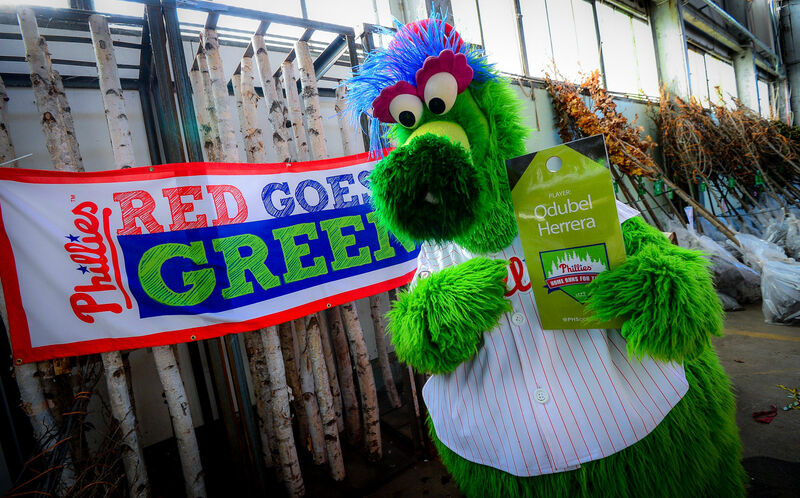 Exclusive opportunity to offer a retail product co-branded with The Phillies. Exact application of logo rights and frequency of use to be mutually determined during the course of the agreement. 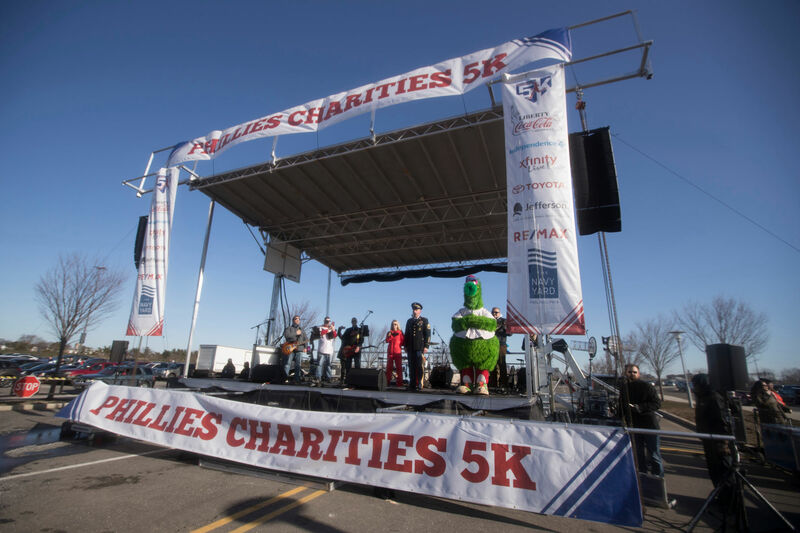 Phillies Charities, Inc. is the fundraising arm of the Phillies organization, serving the tri-state area and the Phillies Minor League affiliates. 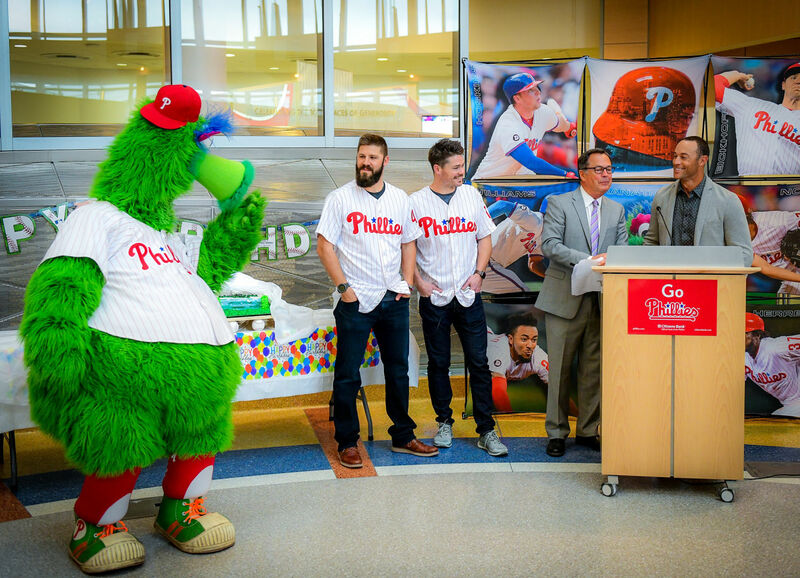 Phillies Charities Inc. awards grants to a variety of charitable organizations each year. 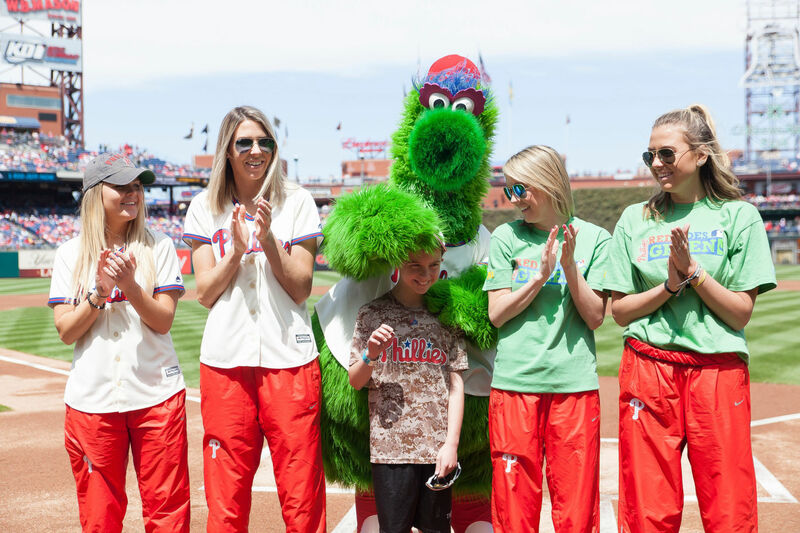 The Phillies family - from the players, coaches and their wives to the alumni, Ballgirls and front office staff - consider it a privilege and a pleasure to give back to the community year-round. 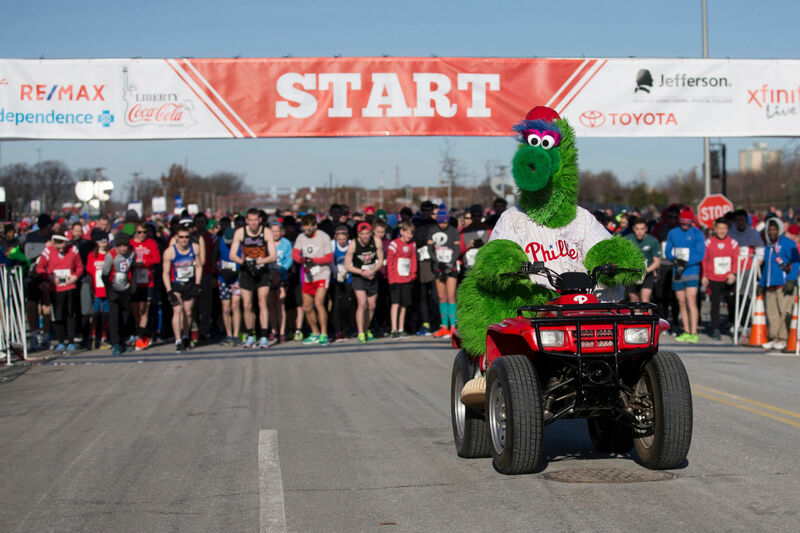 The annual event, capped at 6,000 runners, benefits Phillies Charities. 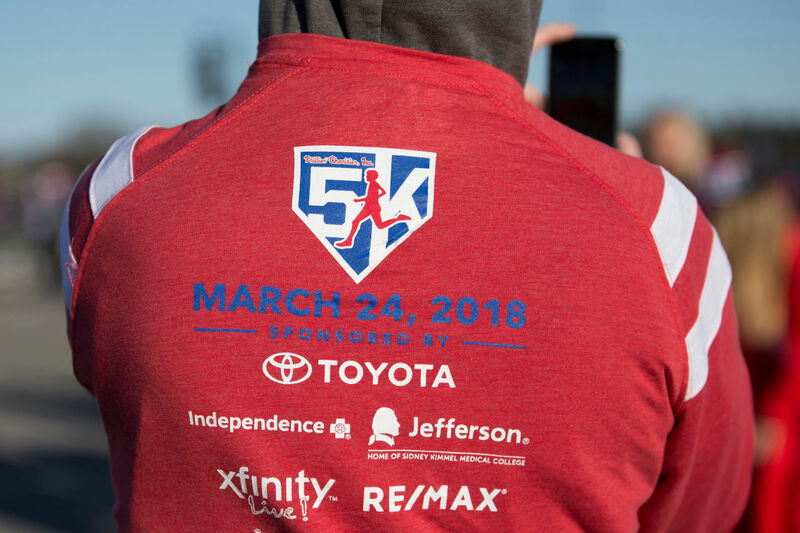 Each participant receives a long sleeve tech tee, finisher medal, gift bag, personalized bib, 20% discount coupon for the Majestic Clubhouse Store and voucher for four tickets to a Phillies game. 2018 finishers: 58% female, 42% male. 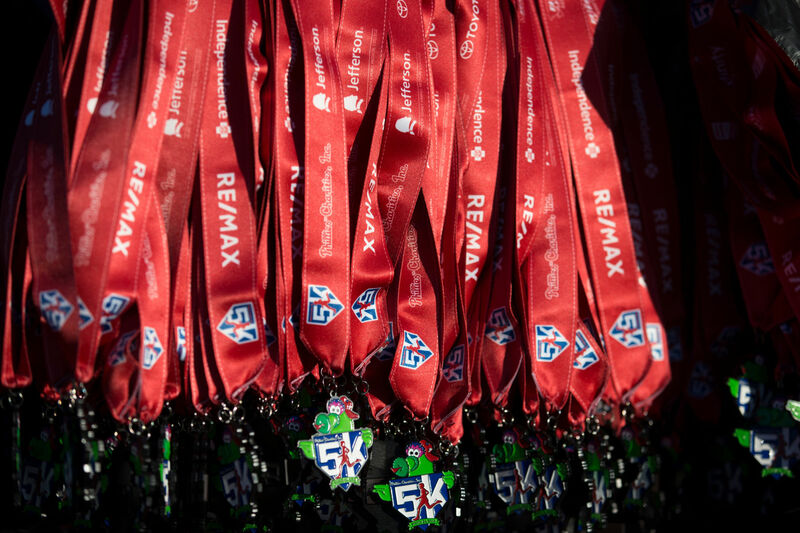 Highest percentage of finishers, both female and male, ages 30-39. Day-long event, geared specifically towards women. 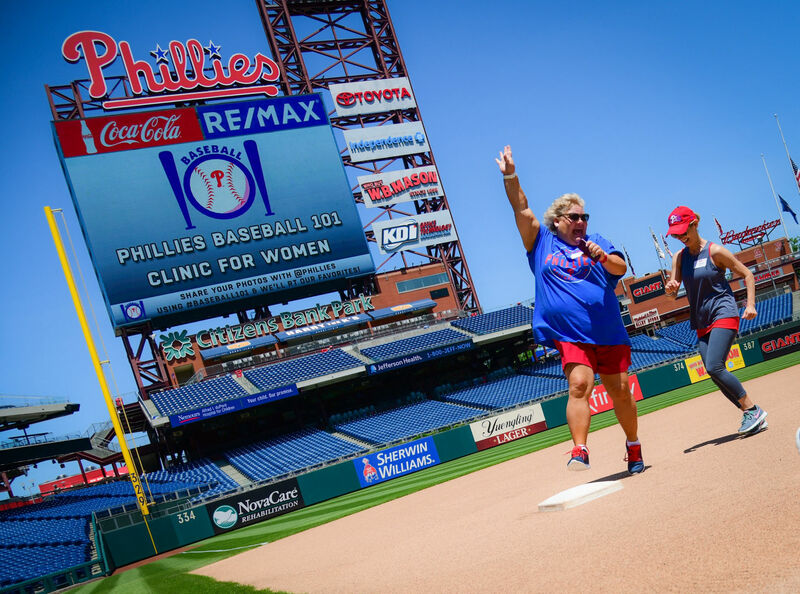 Features an interactive, on-field clinic with Phillies coaches. Q&A sessions with a Phillies player, manager, broadcasters, MLB umpire and members of the front office-team trainer and chef, PA announcer, baseball administration. 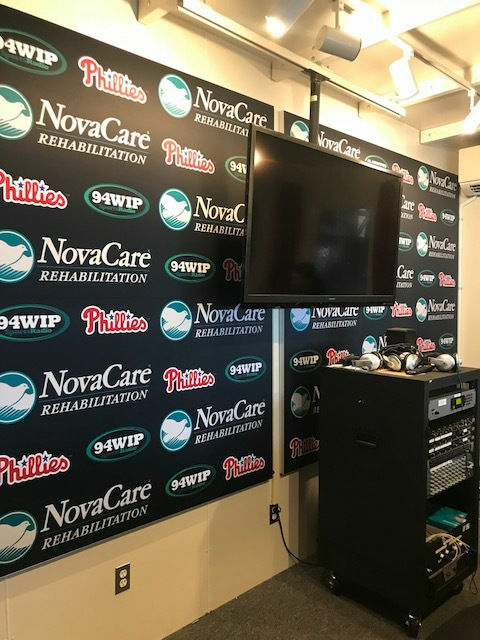 Behind the scenes access to the Phillies clubhouse and PhanaVision. 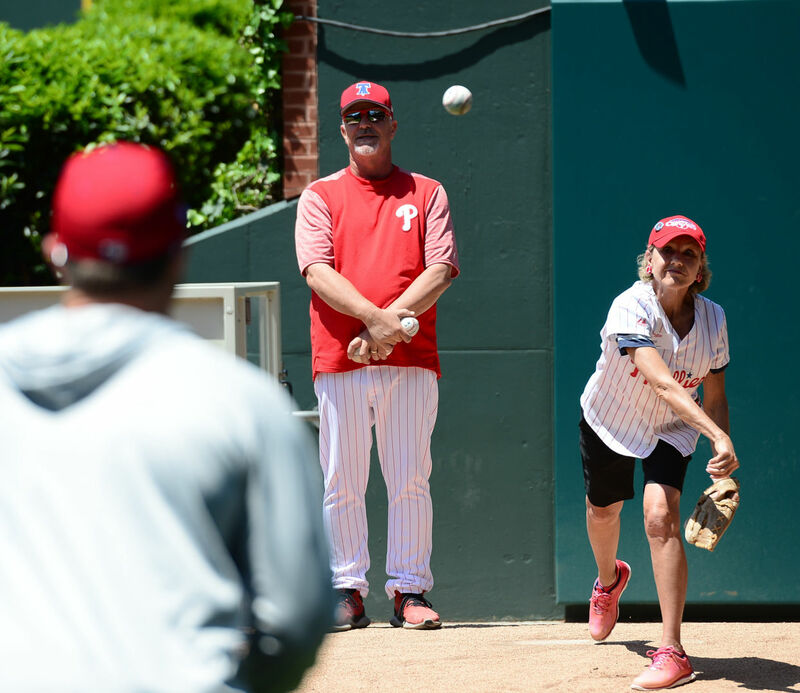 Early entry for Phillies batting practice. Pregame tent party and game ticket included. 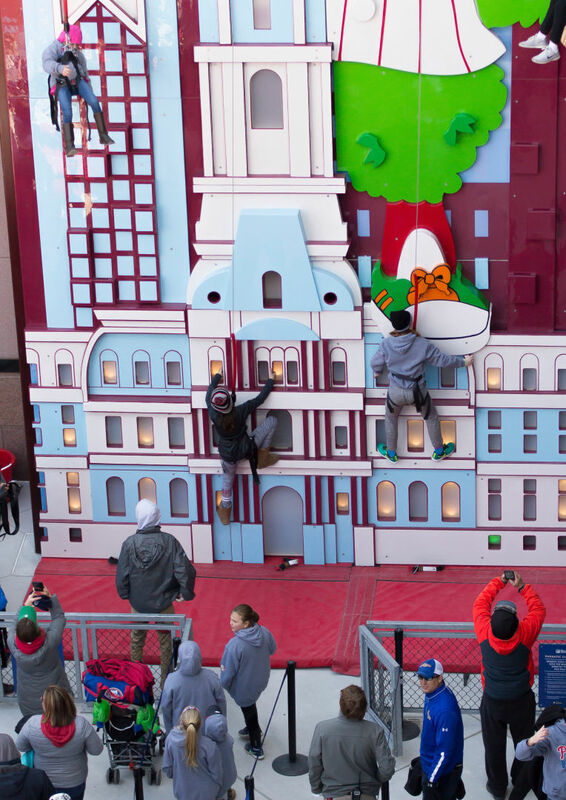 Philadelphia is a city rich with cultural traditions celebrated across its many diverse communities. 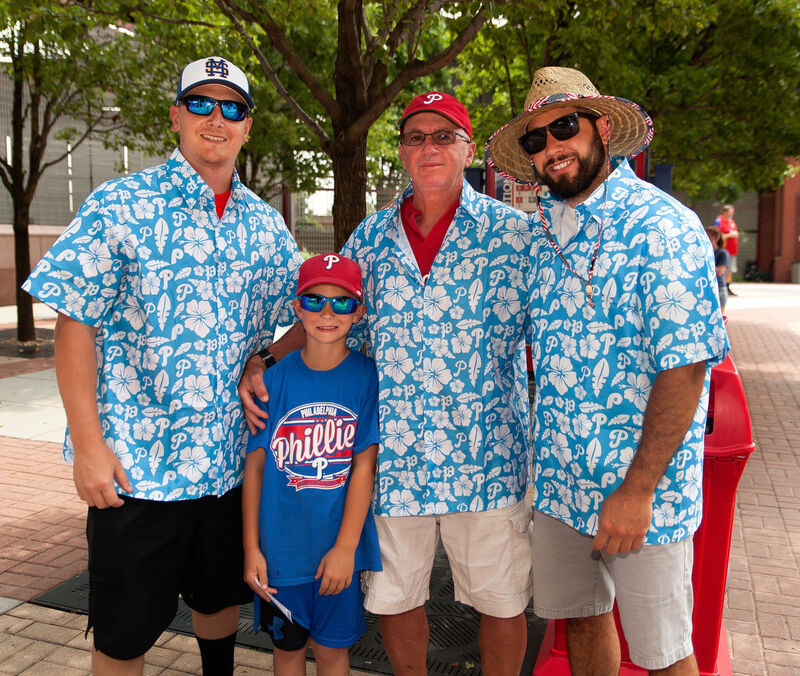 The Phillies are proud to embrace these traditions each season at Citizens Bank Park, and share in the celebration by participating in community and cultural festivals throughout the year. 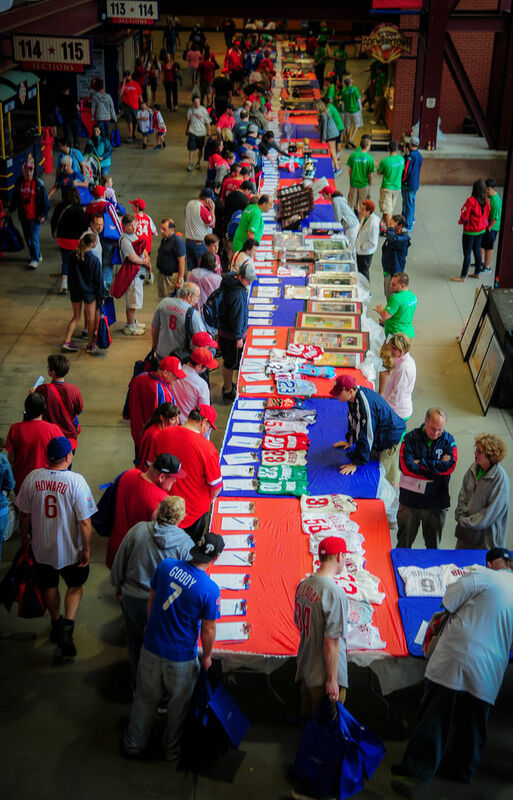 By featuring fun Phillies items and promoting the Phillies' various heritage nights, the Phillies connect with festival attendees and bring fun and baseball into the community. 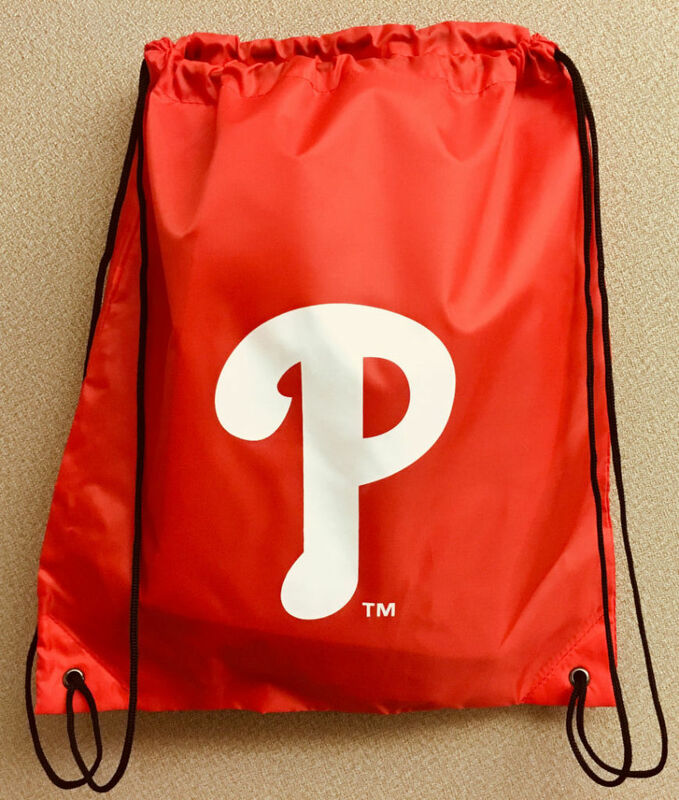 Along with a variety of fun Phillies giveaway items, Phillies tables also now feature a Red Drawstring Phillies backpack for festival attendees, a versatile way for attendees to display their Phillies spirit and help to create a Phillies presence at community events. The drawstring backpack was produced through a local Certified Minority Business Enterprise vendor. Volunteer groups are invited to home games to assist with recycling efforts in the seating bowl. 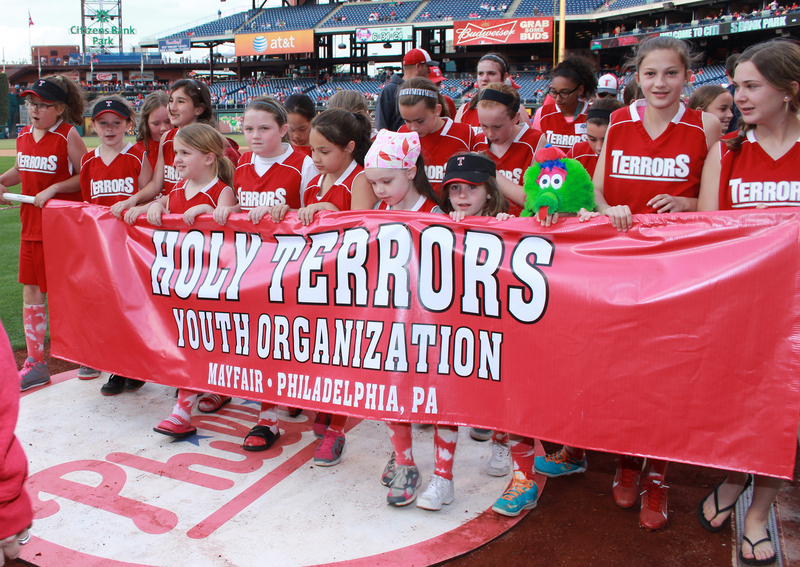 Phillies Ballgirls act as captains of the team. 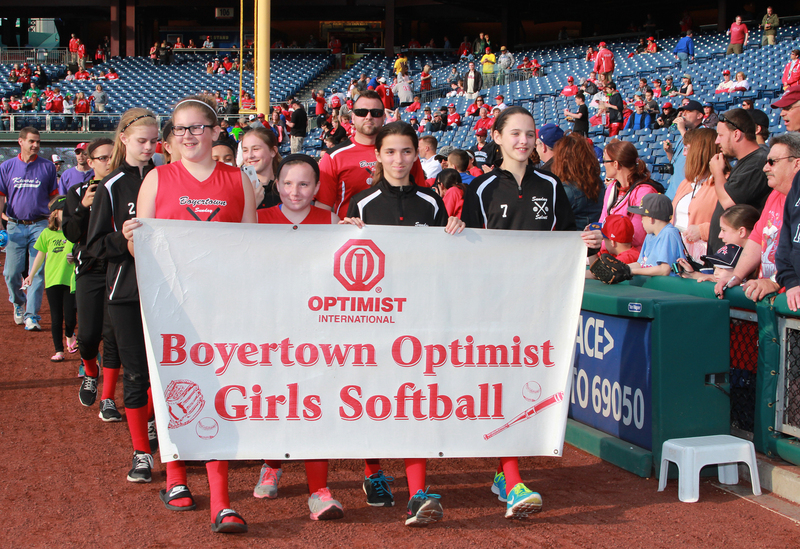 The ballgirls and volunteer group name are announced pregame. 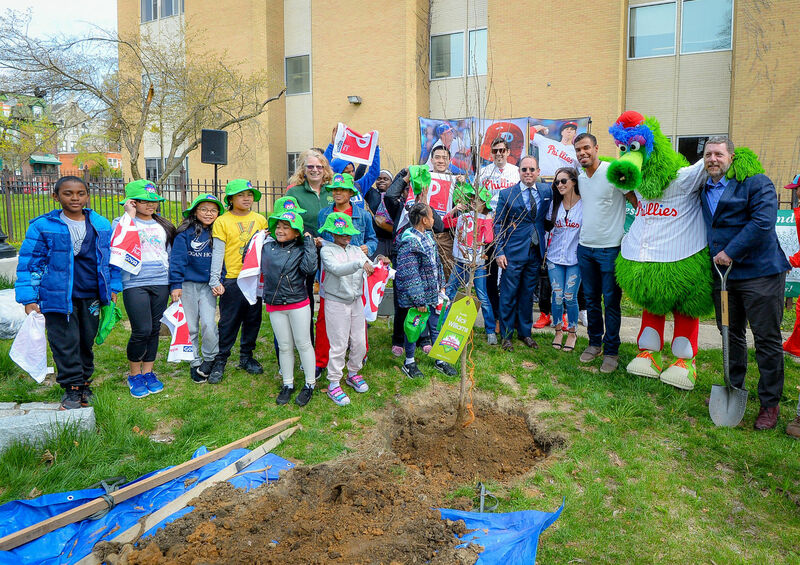 The Phillies are committed to providing opportunities for the youth of Philadelphia and surrounding communities to become engaged in baseball and softball. 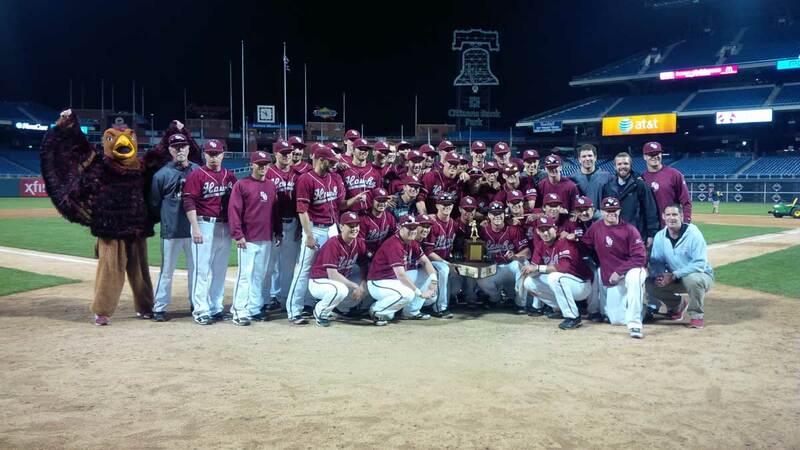 Local colleges have the opportunity to compete yearly in two collegiate tournaments administered by the Phillies. The Bill Giles Invitational hosts local Division I colleges while the Liberty Bell Classic features Division II institutions. 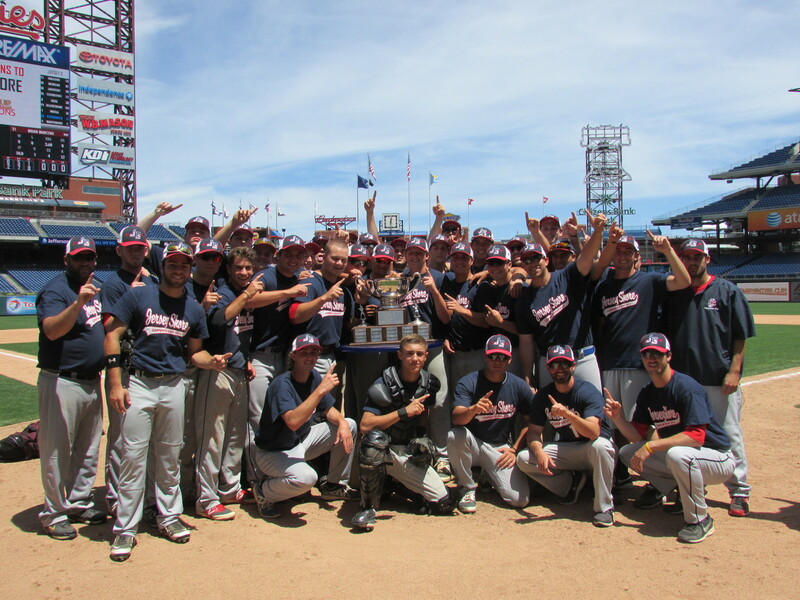 Both tournaments culminate in a championship game played at Citizens Bank Park. 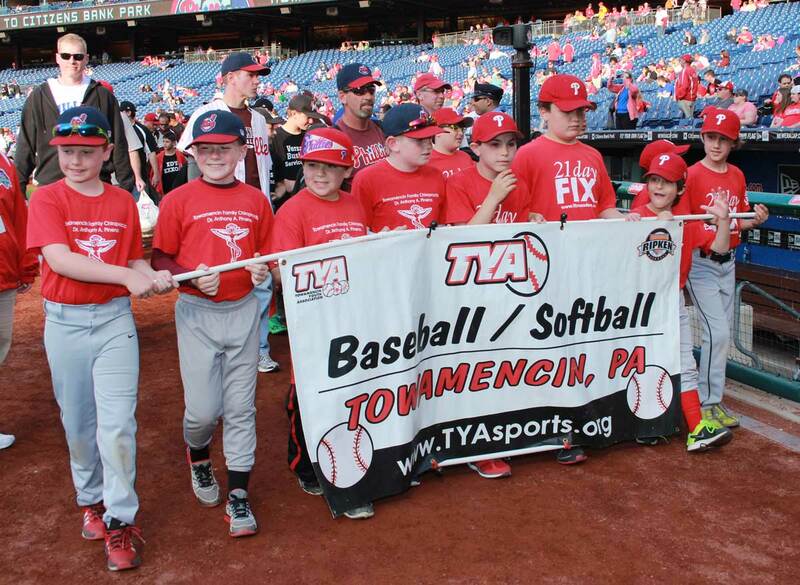 Each year more than 400 high school baseball and softball players from the tri-state area are able to showcase their skills in front of major league scouts and college/university coaches. 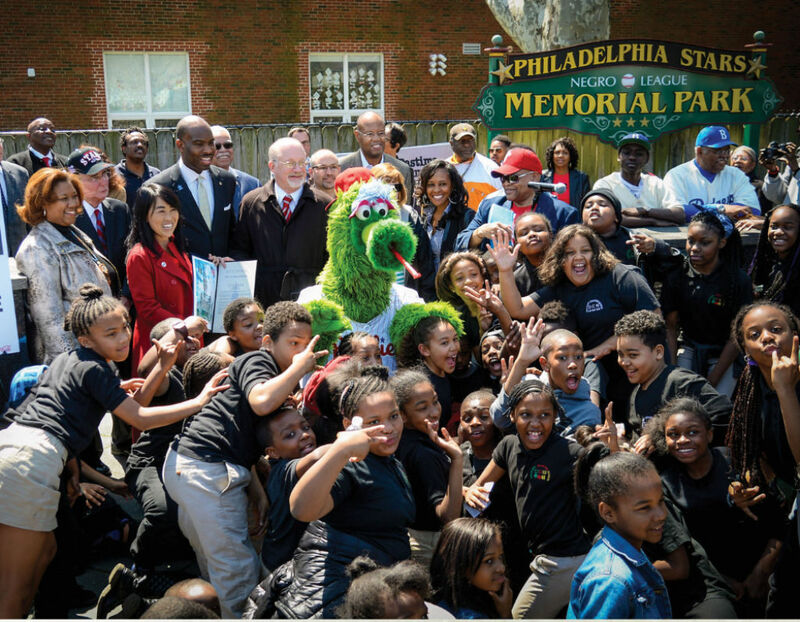 The Urban Youth Academy offers free baseball and softball instruction along with education opportunities to kids in the Greater Philadelphia Area. 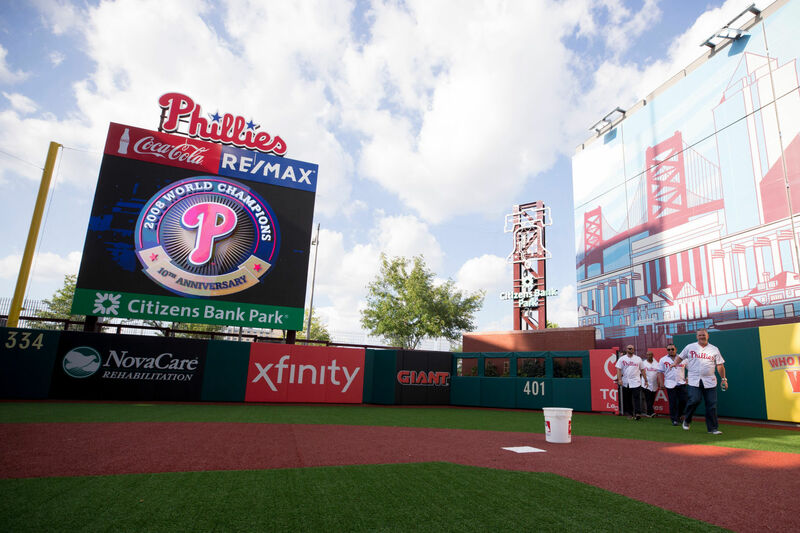 The Phillies host the annual Phestival at Citizens Bank Park on a non-game day for the benefit of The ALS Association, Philadelphia Chapter. Since 1984 over $16 Million has been raised for ALS research and patient programs. 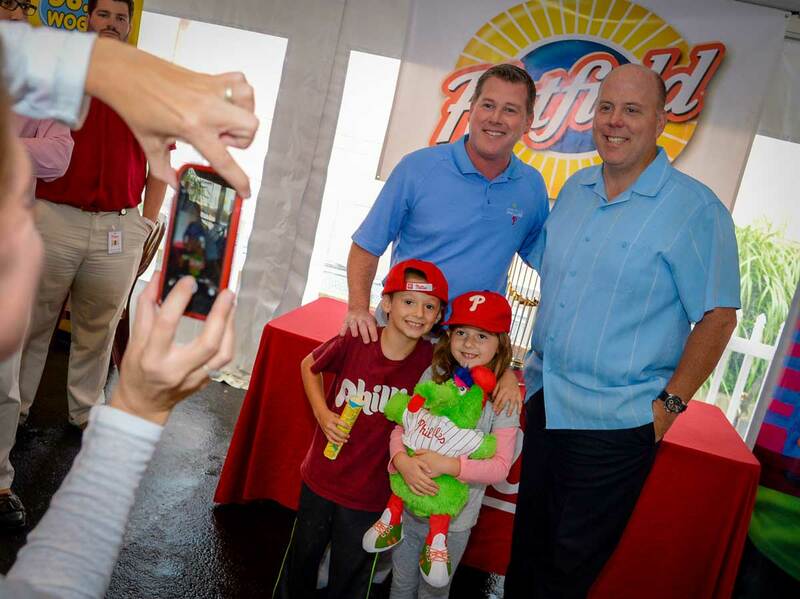 Approximately 5,000 fans attend the event that sees all current Phillies players and coaches participate in autograph or photo booths. 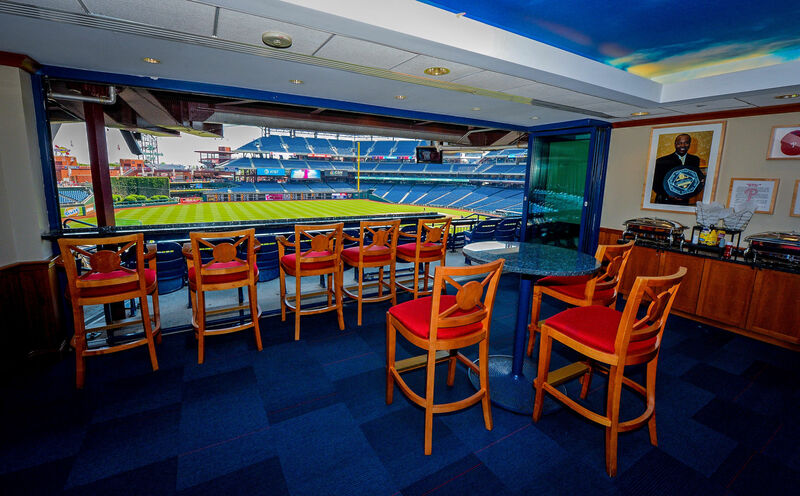 A Phillies partnership gives direct access to Citizens Bank Park’s many Premium Seating areas. 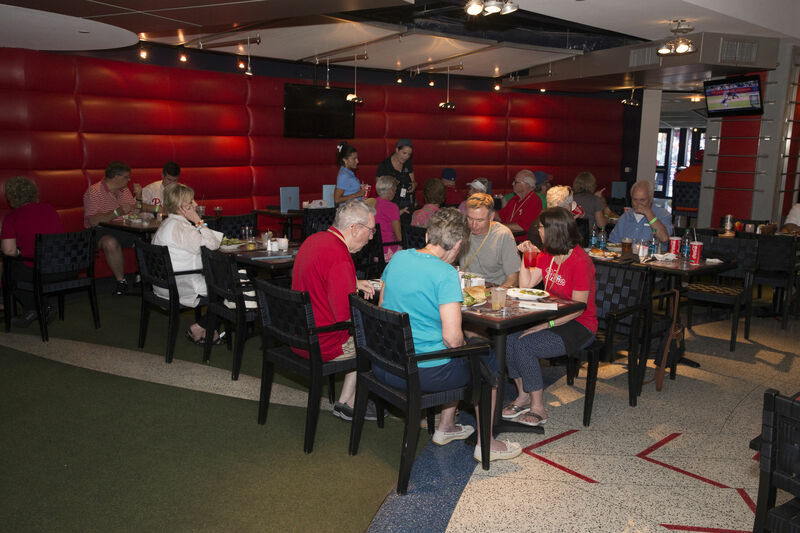 The benefits of Premium Seating include: magnificent sightlines, spacious climate-controlled lounges, full-service bars and upscale food options as well as wider, padded seats with more leg room, private entrances into the ballpark, and private restrooms. 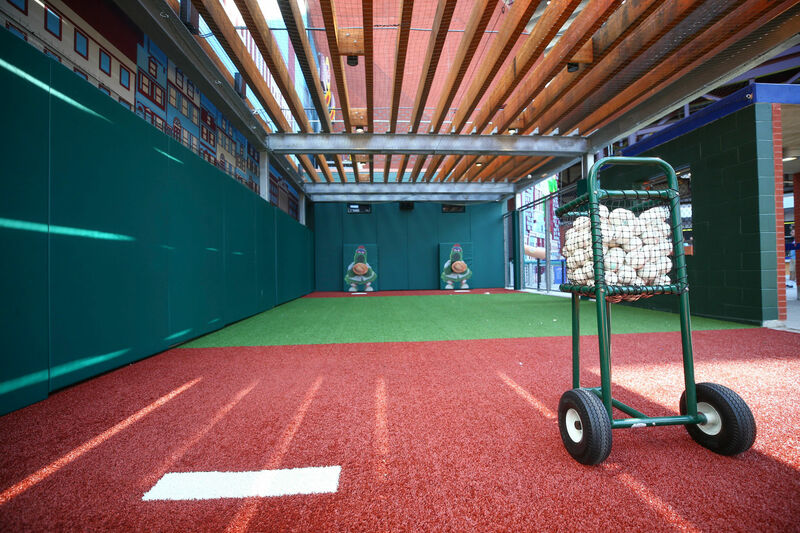 A pre-game batting practice tour allows your intimate group field level access so you can get as close to the action as possible while the Phillies take batting practice. Your guide will also show you other behind-the-scenes areas not open to the general public. 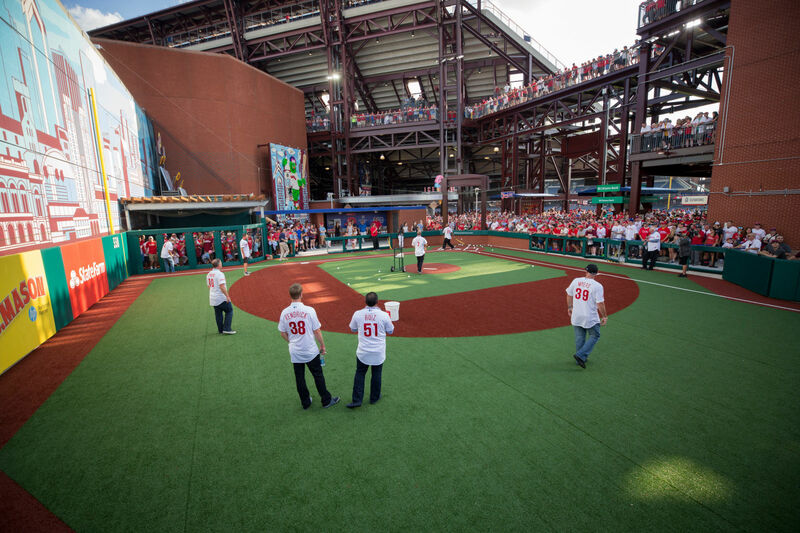 The Party Tent is the place to entertain your group of 100 or more guests before a Phillies game. Located just outside the ballpark, the tent offers a casual atmosphere with ample seating for your guests as well as room for socializing. 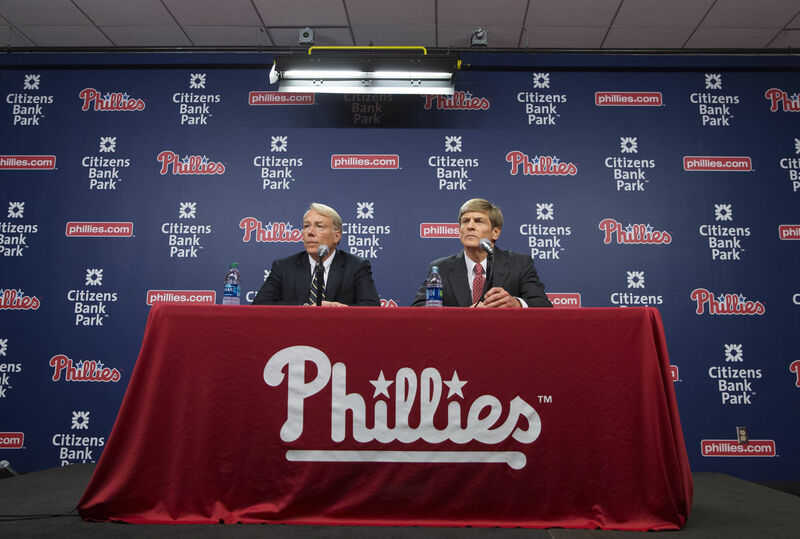 Thank you for your interest in partnering with the Philadelphia Phillies. Please contact us for more information regarding potential opportunities.